So here we go on Carnival again, from the same port we left on our first cruise 8 years ago. This is our 7th cruise and 4th on Carnival. 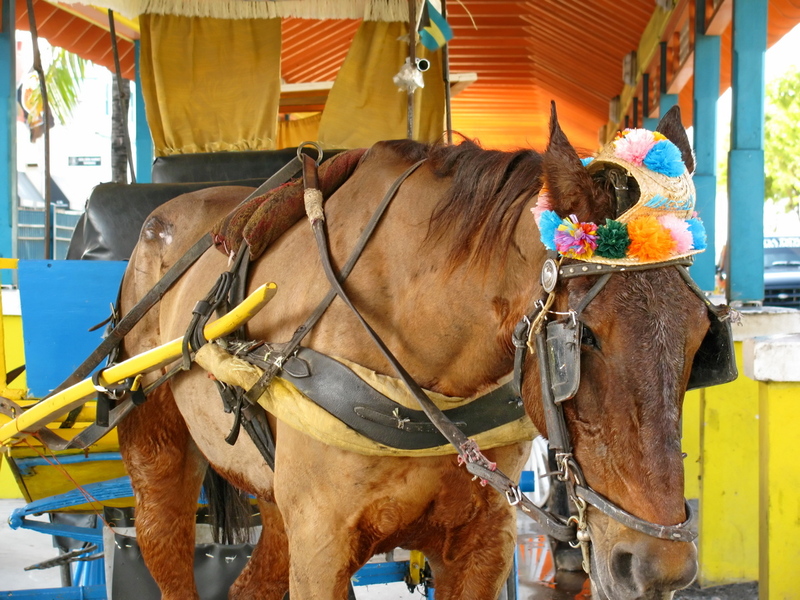 What can I say, Carnival is inexpensive, but I am a strong believer in you get what you pay for. A great way to have an inexpensive holiday that will take you to see a few new places and you can afford to pay for the kids to come along. Which we did this time. 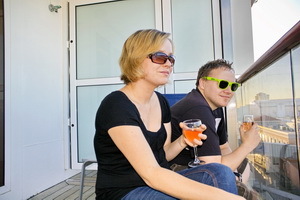 Shawn and his fiancee, Amber, came along this time for our first holiday with adult children and their first cruise. It was actually Amber's first time leaving Canada for a trip and she had a great time. Prices and Cruise Line Summary Comparison - Don't get me wrong, this trip wasn't a super cheap bargain, it was over Thanksgiving at high time. $2000.00 for Robin and my oversized balcony room, just over $1500.00 for Shawn and Amber's inside room, and my parents also came along in the same room type as Robin and I, with the over sized balcony, at just over $2000.00 (with taxes and insurance in) for their room. That makes it $5500.00 for 6 people, for 1 week, and that is not all inclusive. After the initial outlay there was tips of $11.50 per person, per day, so another 483.00 for the 6 of us on tips (which you are allowed to adjust after they charge them, based on your service), and then parking is $140.00 at the cruise dock or get a room and a pay hotel for parking but we won't do that next time, it was a long wait when we got back for that hotel shuttle. 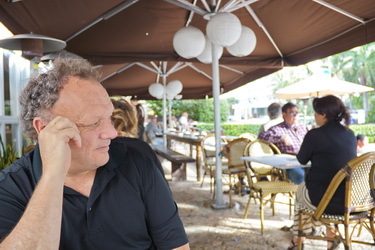 After all these expenses add on costs to get to the cruise dock (flights and gas), any extra shore excursions and meals in different restaurants, be they on the ship or on shore and it is by no means a cheap holiday, I could have gone camping, lol. My husband says we could have bought an RV and gone camping. Not quite. But you get the picture and this and NCL are typically the cheapest cruise line to travel on. But the difference over all is marginal, at apx. $150.00 to $200.00 more per person that it typically costs on Royal Caribbean (said to be same class as Carnival but people find them better), Holland America, Princess, Celebrity, it was really only an additional 10% more to the base trip cost. Not to promise anything better but I have enjoyed most Royal Caribbean and Norwegian's second cruise was much better then I experienced ever on my Carnival cruises (for food, staff and service), but the first NCL cruise I took was my worst over all. So it is probably a toss up. I do not enjoy the food quality or the disembarkation process with Carnival Cruises. 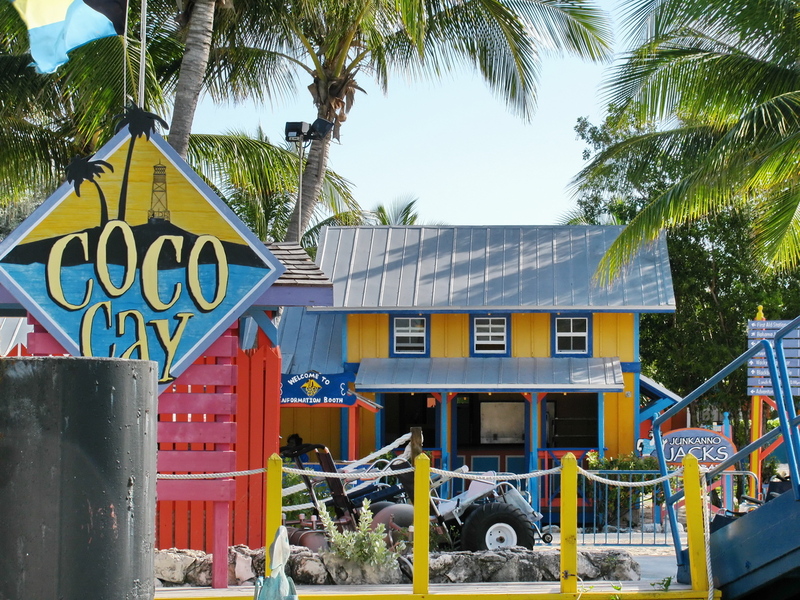 The food is questionable quality and the disembarkation for shore excursions and on cruise completions is an unorganized mess, with lost luggage, long lines and confused staff. This is where Carnival has consistently fallen down on every cruise I have taken with them and others have shone there in comparison. It really makes me personally feel that it is worth the extra 10% to take the competitors and I promise myself again, my next cruise will be on Holland America or like premium line, that at a time cost the same as the economy lines, and when next traveling on the economy lines I will choose Norwegian or Royal Caribbean. Had enough Carnival for now I think. I say this now then some super deal comes via email and you never know. So on to the fun part... what did we do! 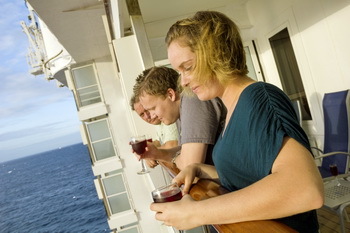 Carnival cruise lines does allow you to bring on 12 small drinks (water or soda) and 1 bottle of wine each. This is the only cruise line I know of that allows this unless others have started to follow suit. Very nice to sit on the balcony and watch the happenings below before leaving port while sipping your wine. I love this. As we had an assisted boarding, the ship boarding was rather hassle free for us. Unlike boarding in Port Canaveral, Tampa staff were able to assist my mother on board with a wheel chair. I had said ahead of time she had RMA and would need possible assistance due to stairs and distance to her room. 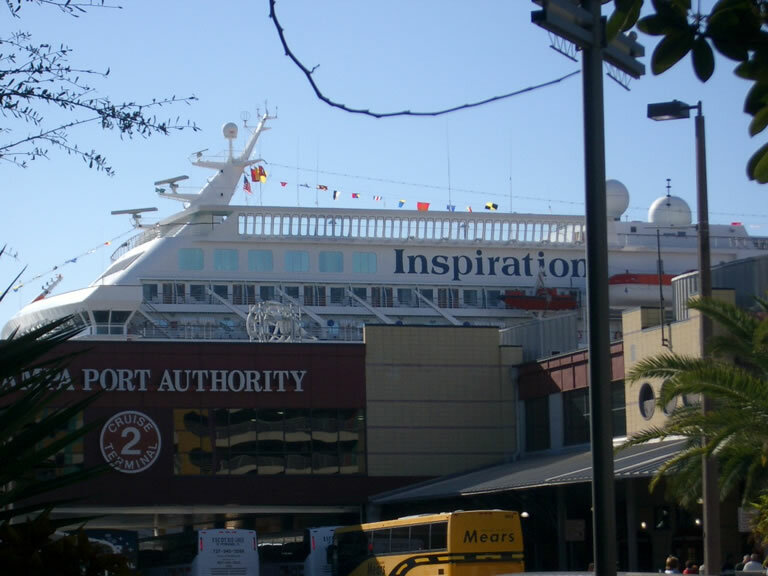 Port of Tampa was set up for this and wheeled passengers needing assistance on through special lines and allowed the family to board with her, due to my mothers need for assistance the 6 of us boarded hassle free and quickly. Our rooms were ready for us when we boarded at around 1pm; I could see there was lines for others. I greatly appreciate that they had assistance available as this was not available on their ship at Port Canaveral, the lines and journey on in Port Canaveral had really worn her out. She should bring her walker and/or a wheel chair but she hates flying with the stuff and can walk, but not stand around, for limited distances a limited amount. If my parents choose to come again (they did not enjoy this one due to their limited mobility and a few other issues we'll get to) they will arrange a wheel chair rental for the week. On boarding the pool was open, the buffet was available and the mini golf and basketball. Good thing as there was over 700 children on this Thanksgiving cruise. 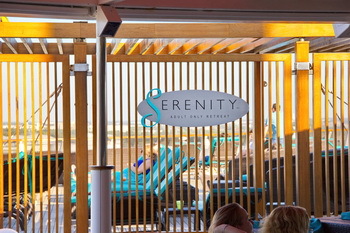 We spent a lot of time in the Serenity area (adult only corner) over the cruise course. As you can see above, after a day of hanging around Tampa enjoying some wine on the balcony and chatting about what to do in the days to come, we set sail as the sun was setting for our week of fun. Food - Day 2 and 5 were at sea days. 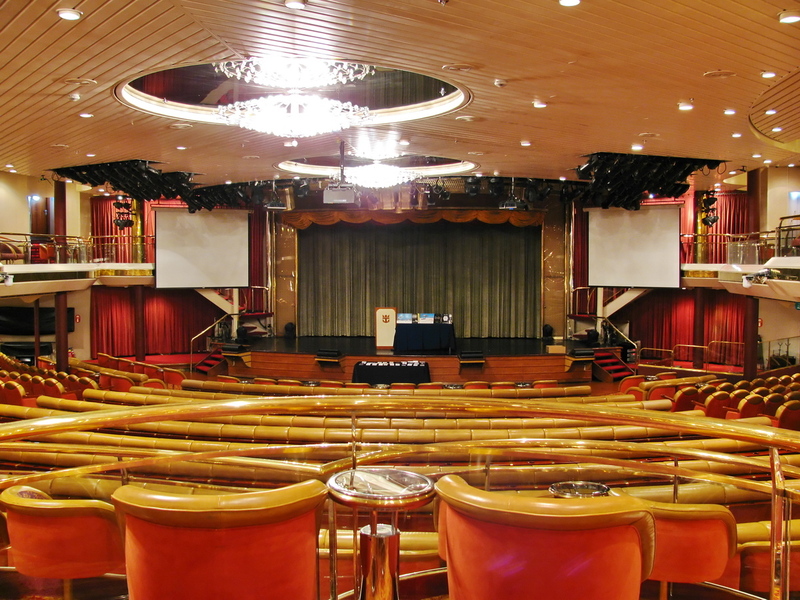 We lounged around the boat, played in the casino and saw some great comedy routines. Breakfast delivered via room service is always my favourite part of any day. 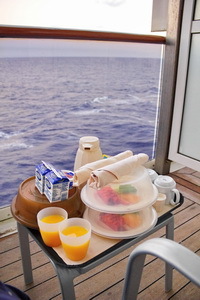 There's no better way to wake up in the morning then a pot of hot coffee and some fresh fruit in the warm sea air. The food was really not up to par on this cruise, so find what it is good and stick to it for your orders. The citrus plate was filled with pieces of orange or grapefruit that was dry and tasteless so that my son and myself couldn't actually tell what was oranges and what was grapefruit, and didn't get better through the week as a couple days later it was ordered by Amber and was about the same. The mellon plate was good enough, watermelon, cantaloupe and honeydew melon all seemed fresh enough without being past and I ordered it and a banana each morning along with cereal and coffee. The breads were not fresh, but a box of cereal and some milk you can't go wrong with. I wouldn't chance eggs on the balcony, but we went up to the buffet for omelets a few mornings. There is an omelet station but if you don't want to line up there was 5 places that would make fresh eggs how you wanted, so pick the shortest line. One fellow at the deli made a much nicer omelet then the omelet stations and we went to him after he was discovered by my son on day 2. The one thing you can count on the cruise to have is plenty of food. You won't go hungry, you can always find something to your liking if the first thing you pick isn't. Food choices on the Legend were the Lido buffet, Main dining room, room service, or the specialty steak house at $35.00 per entree and tip. Milk, coffee, tea and water are included with dinner and lunch, any other drinks (juice, soda, alcohol) are extra. This sailing, being high season with kids out of school, was packed and sailing with over 2600 guests, while it typically sails with 2100 guests. This meant long lines for most services, food included. There really wasn't a quiet or lull time to be had. My best luck was hitting the buffet at 7am but I was normally on my balcony at that time, and I would head up around 10 or so for an omelet, french toast, pancakes, bacon, sweets, you get the idea, what ever you wanted. Even at 10 it was easiest to find a seat in the serenity, 21 plus area and quietest there. 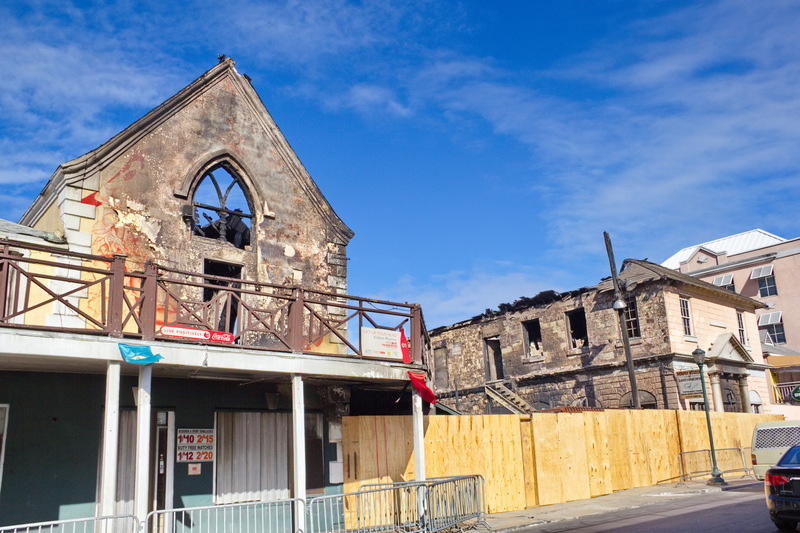 The dining room was open for breakfast and lunches until a different time each day and you had to be careful to check open and close times if you were going there. 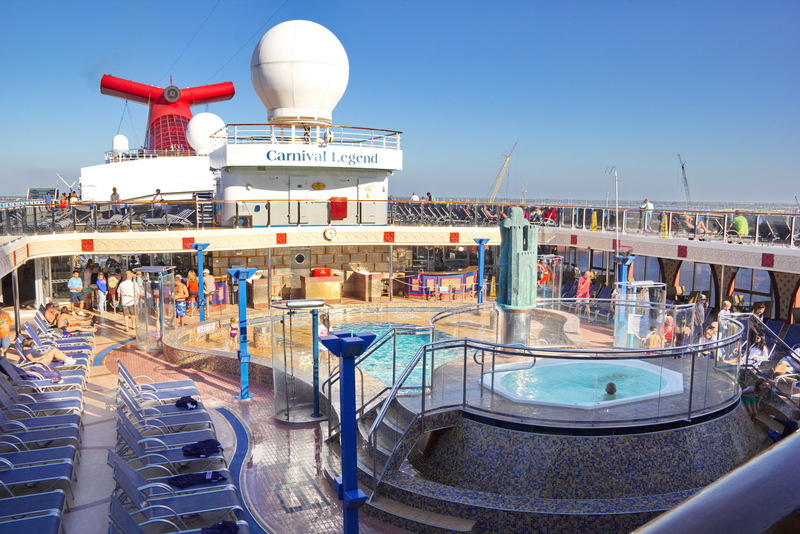 On the disembarkation day it was only open to 8:30am, you'll hear more about this when I write up on the disembarkation process with Carnival in Tampa. The sit down dining was only open for lunch on Sea Days. The family would have preferred to have a sit down option for all meals as we don't mind the buffet for a snack but really prefer a meal be quiet and someone delivers it to us where my mother can sit and relax, not needing to stand in lines while hurting, and we can all chat about the day while waiting on our food. Buffet's are so rushed, hurried and noisy and everyone has different lines to wait in and talking over a meal at buffet is rarely possible with everyone up and down at different times. Breakfast - About every other day we met for breakfast in the dining room. My parents like Eggs Benedict but my dad, as a chef was extremely unhappy with the food quality. 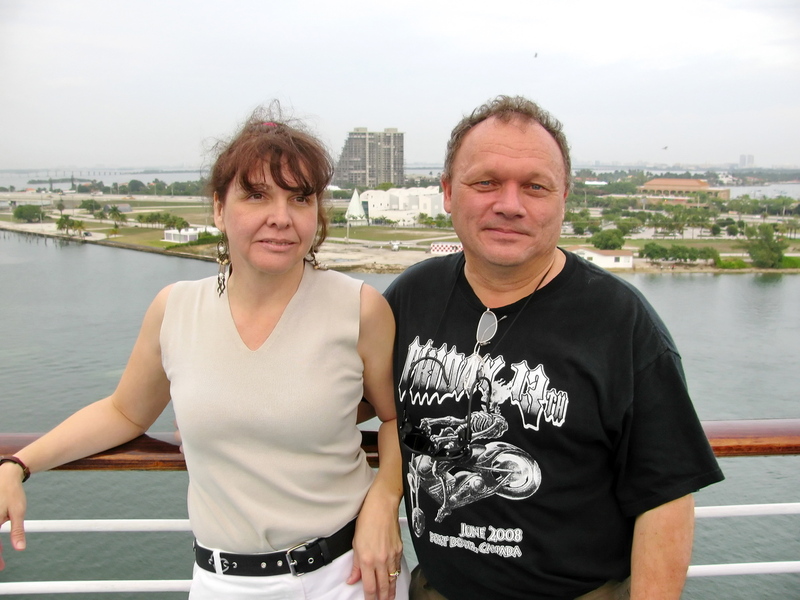 Until they started to cruise with us, my parents had been a accustomed to Princess and Holland America. The Carnival line doesn't hold up to those lines and is not in the same class. My mom doesn't mind and enjoys that everyone can come along at the price but dad can't stand that he pays the same price as he could pick a cruise on the other line for and they don't have the same standard of food and service. The eggs benedict is rather dry, the sauce cooked hard, so dad tried ordering sauce on the side so he could pour it on. One morning my mother's fried eggs were delivered in what she thought was water on the plate (that was the undercooked eggs) and we looked as she tried to pour the water off we had the waiter take them back. He looked and said but you ordered them over easy. That was the wrong thing to say. Over easy is not raw... where do people get the idea that an egg over easy should be clear with just a thin white coating? Over easy is turned gently to not break the yolk, a cooked white and soft yolk. It's explained quite well, scroll down to US and Canada on wikipedia, maybe the cooks should have a read. Over medium will have a slightly cooked yolk, most soft and over hard is self explanatory. I usually order all eggs over medium these days as cooks today seem to have a difficult time with the over easy (don't break the yolk) concept. The rest was adequate, no great service at breakfast to gush about, nothing to extreme other then the egg incident. The dining room was quiet, most went to the buffet where the food choice is more varied and slightly better cooked if you don't' mind the noise and line ups. Lunch - The dining room lunch was adequate, we could get soup and something to eat in a quiet place where they brought it to our table. There was no incident stands out on either good or bad from lunch so it was fine. Dinner - Dinner in the dining room was pleasant. The Wait crew we had gave exceptional service and I was very happy to have Joseph (head waiter), Jay Jay (assistant) and John (bus boy). They gave above average service and I could see other teams that definitely did not meet their standard. 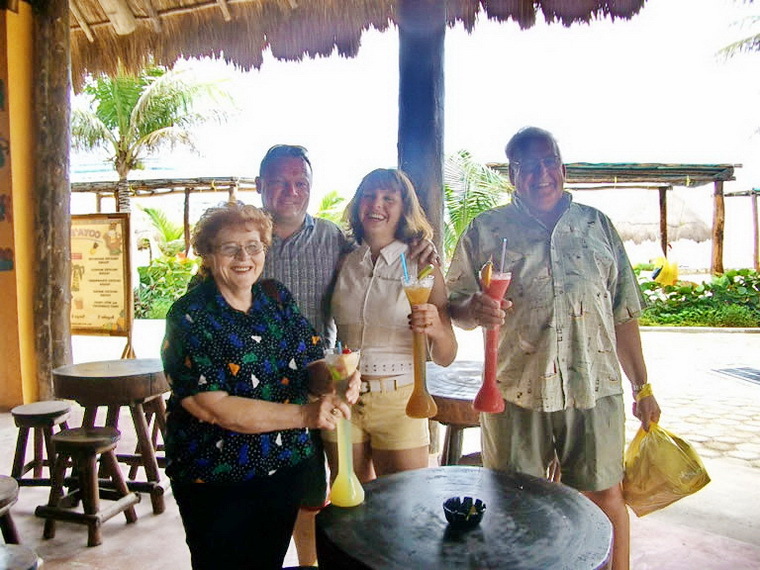 These guys had worked many cruises, had experience and knew how to earn extra tips. The food was acceptable but it wasn't gourmet. I did love the soups, someone knew how to make a good pot of soup. The chicken was dry sometimes, the beef not the highest quality cuts, the presentation not the prettiest. I really have to remember to do photos of this some time. But the service at dinner was great, I had the heart fare meals most nights and sugar free deserts, all were fine. Don't forget to ask for what you want if you don't see it. Wait staff are accommodating and will look for a way to get you what you want. Robin orders a cheese plate for his appetizer every night though it is not on the menu and they happily bring it to him. Bread was served before dinner, it wasn't warmed and fresh, it was cold in a basket, pick a roll, focaccia, rye, etc, with different choices available on different nights. If there was nothing on the dessert menu you wanted you could go upstairs to the buffet to enjoy dessert on the back deck, the buffet did have more options. Along with the dinner fare the dining room wait staff put on the dance and sing show, which is cute and fun, and lets you have some fun with your wait staff. Buffet - As a buffet line up hater, and my mother with RMA, it was a bit difficult to not have a place she could sit down and order a meal brought to her table at lunch all days, but we managed at the buffet. She chose stations with short lines and we assisted with getting her drinks and such. Mom is a trooper really, she got my dad's lunch each day and brought it to him because he was super grumpy about the food, line ups and crowds and wouldn't go get anything for himself. I would say the carving station or deli sandwiches were probably the freshest options at the buffet lunch, but I also enjoyed the hotdogs from the grill twice and the fresh made tortilla chips with the fresh made salsa daily around 2:30 on sea days as a snack before dinner. My son didn't like the taste of the thick hotdogs they served. The fresh made tortilla chips became a favourite of Shawn, Amber, and myself after I spotted them on someone's plate and went hunting for them, remembering them from a prior cruise. Dessert options were plentiful, I tend to just like some jello or rice pudding at lunch, but there is cookies, cakes, ice cream galore. There was a chocolate fountain one evening at the buffet but this was a bit of a wash to us. The line up was huge and the poor fellow behind the one counter at the chocolate fountain was trying to keep up with a small standard kitchen sized fountain, individually dipping each persons plate full of snacks in chocolate. Many had to hand back their plate and say more chocolate as he didn't quite cover items in his haste to get to the next person in the long line for the chocolate. They really needed to have a commercial size fountain for this (I order one of these for a Christmas party for work) and have 3 or 4 waiters to coat items for the cruisers. I appreciated it wasn't left out for all to put their fingers in, double coat, kids to play in, etc, but they still need a large fountain and a few staff to coat items if they are going to offer it. 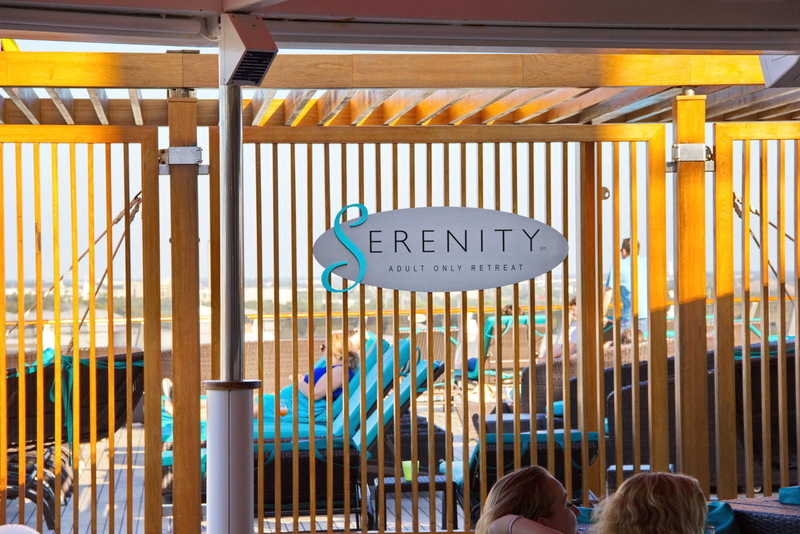 Even on the very busy cruise, seating was usually not too difficult to find on the back deck (21 plus serenity area), or at a wheelchair/handicap accessible table for my mother. It was crowded and noisy at all times in the buffet, the staff though, kept their wits and were pleasant and helpful. 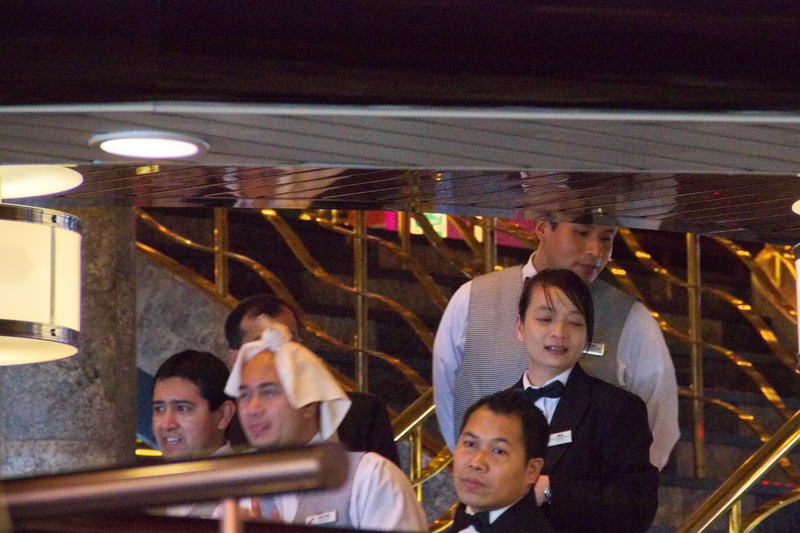 The staff over all on the Legend were very very good at a smile, hello and offering a hand. When we arrived in Cozumel with a very rough plan of what we might do for the day. 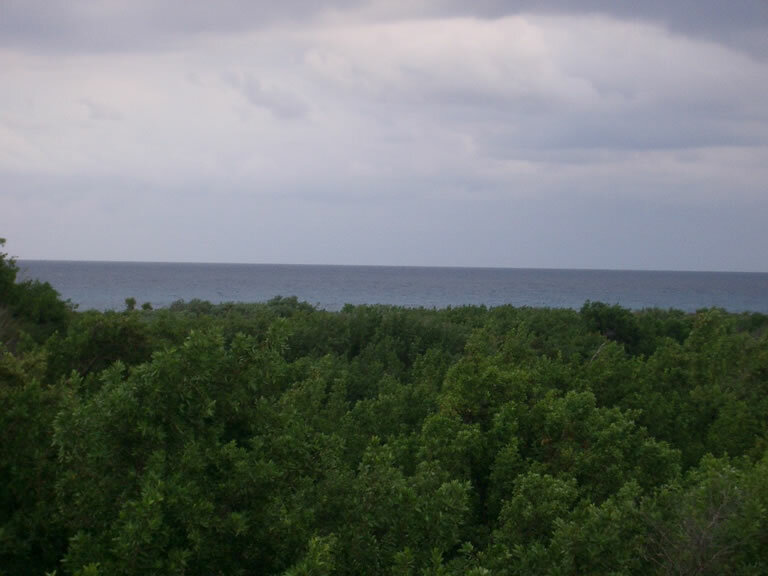 I thought about renting a car which I had done last time and heading to the Mayan Ruins on the Island, and the maybe a couple hours a public beach and an hour of shopping downtown, but we didn't pull in to the near downtown dock we had been at last time. This dock was a couple miles from the down town area and the skies were pretty overcast so we thought we would just head off the boat and take a look around. 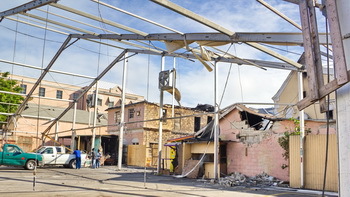 The dock had the typical new, shop here village, the cruise companies are creating at the docking ports. 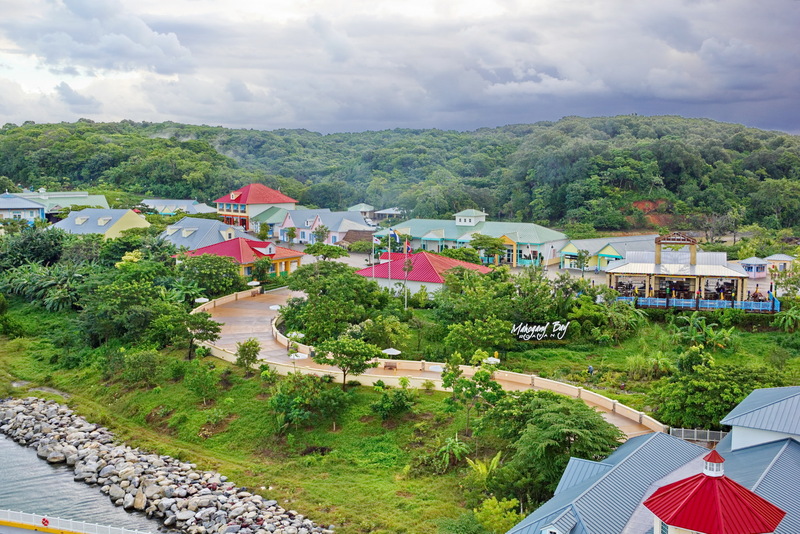 The buy the same thing here you can buy in the next 4 ports out door, tropical looking cruise shopping mall. That's how I view these. I really don't want to spend any money at these, to me it's like buying something at walmart. Every other cruiser will have one too. 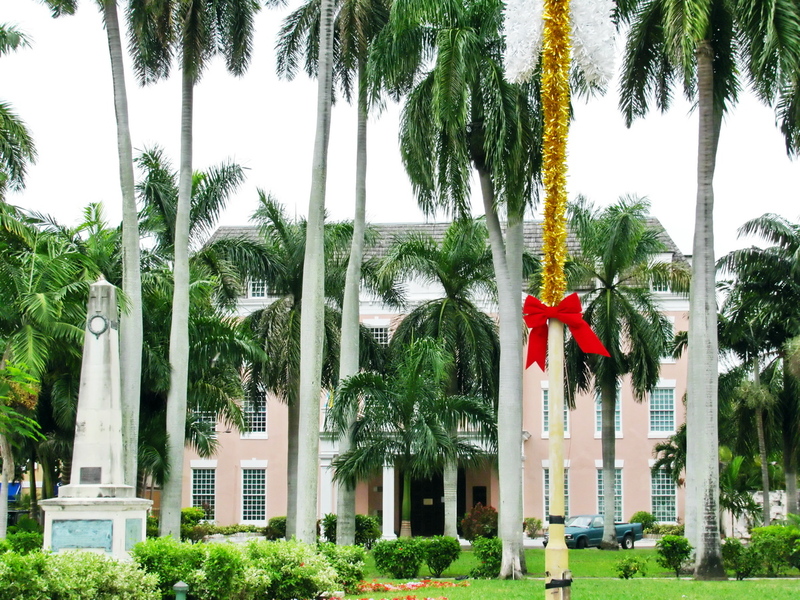 We talked to a security guard who informed us there was a celebration downtown at the government buildings and schools were out and a parade type happening would be going on. We did, through our weak spanish and his weak english eventually figure out what he was telling us. LOL, what he first said is "There's a military revolution going on downtown right now." My son looked worried and he smiled and said "a celebration, that right?, re-enactment of the Mexican revolution". Then we understood. Sounded great so when he said it was about 2 miles from the dock and we were already a half mile away from the dock we decided to keep walking that way. Well it started to pour, really pour. After we were all sufficiently drenched we headed back to the boat without ever reaching downtown and decided some mini golf and wine on the balcony, a little work out in the boat's gym and we would have a fine day that way, so that is what we did. It did start to clear in the afternoon, giving hope tomorrow would bring better as we were leaving. 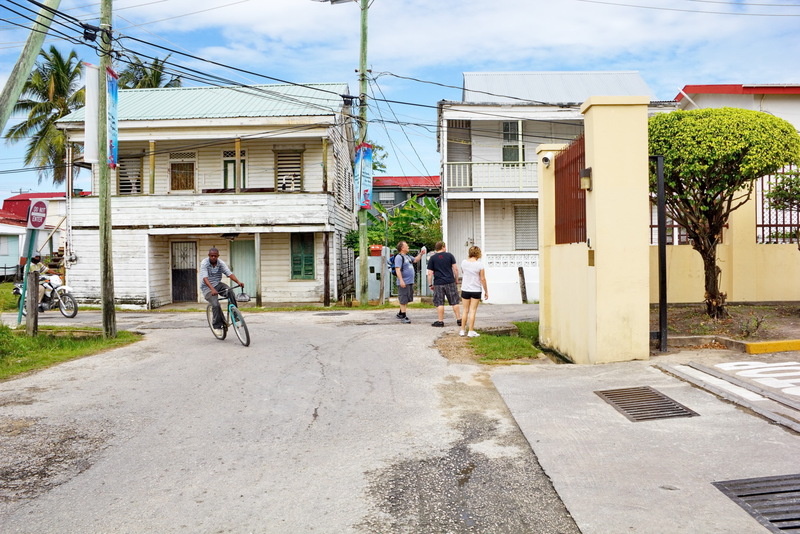 Belize City, Belize seems to be either loved or hated by its cruise visitors. I find it fascinating. It's not like landing in the USA, that's for sure. 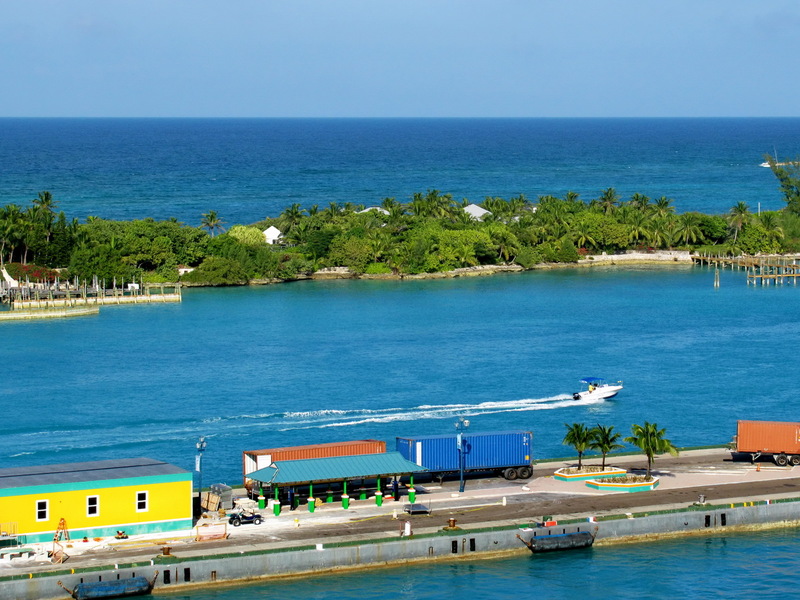 It has undercurrents of crime, it's run down, it is not commercial, but everyone that is there wants to make a living off the boat tenders at the dock (Belize is too shallow to bring in the cruise ship and passengers are tendered in). 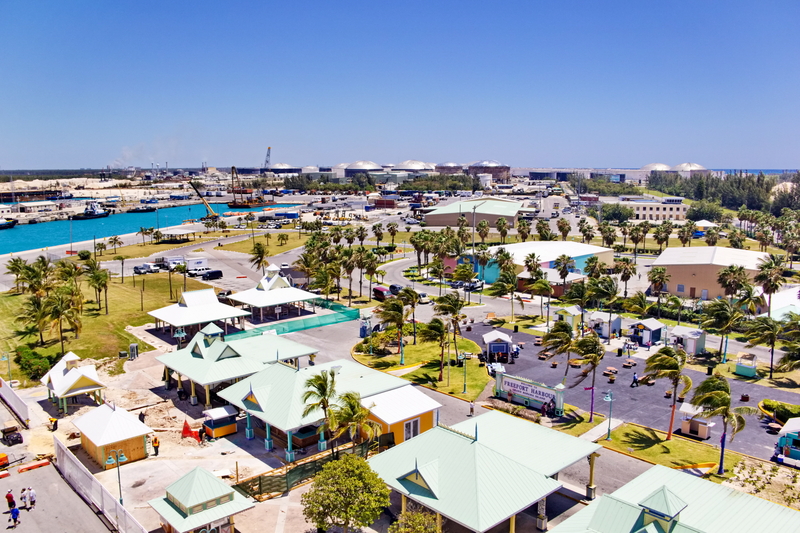 Many cruisers never leave the safety of the cruise built pier malls when they come here, or they go off out of the city on a shore excursion. 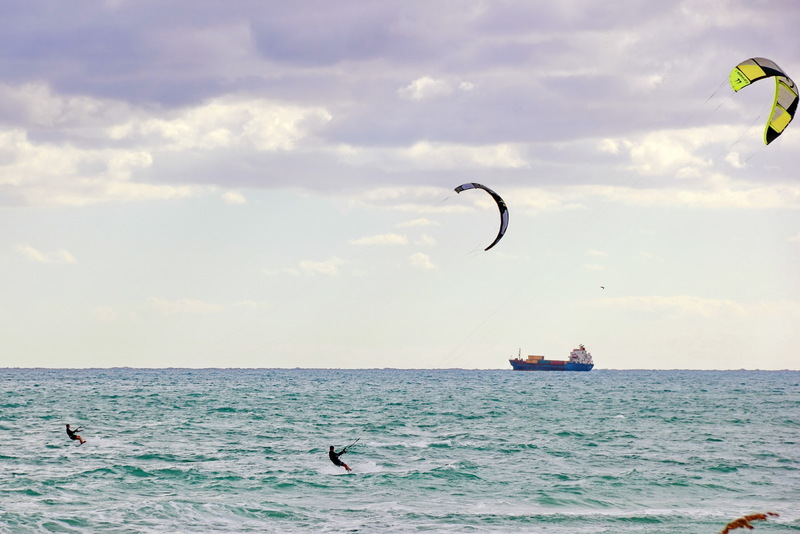 The popular shore excursion seems to be cave tubing or zip lining. We planned on zip lining, from a source found online before arriving we did not want to cave tube ( I just find the idea of walking through shallow indoor water with hundreds of others distasteful) and zip line which the cruise offered, and I wanted to do a couple hours of zip lining not just one go. The weather looked like rain again so we cancelled that plan for a walk around town while the rain held off. You will see nothing but real everyday life here. 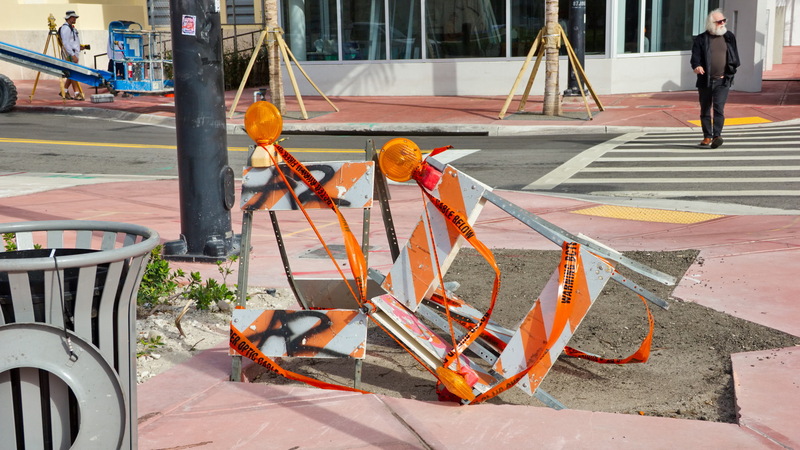 It's not pretty to some, it looks a little depressed, but honestly, it's rare to find a city core in the USA that doesn't have it's depressed areas. I like the realness that is Belize and it's people, making it a favoured port stop for me. The Belize City Museum, which is an old jail closed in the 90's and is now used as a museum showing Mayan artifacts, bugs of Belize, butterflies of Belize, and examples of where the prisoners were kept and tells of the Belize history, is an interesting look through the history of Belize in walking distance from the port and for a total of $5.00 each that is well spent to help them keep this going. The young ladies working were great and as I said, I find a walk through this city is real, not put on like most cruise ports. I really would recommend stopping in to the museum if you aren't doing a shore excursion. 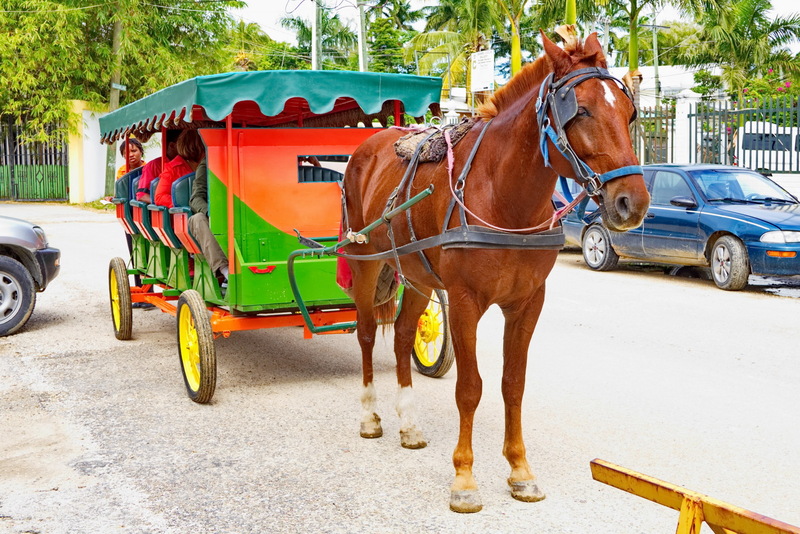 They don't get the cruise passenger traffic and it's a really good over view of the culture and history of Belize that you won't find other ways. The girls at the front desk are super friendly and answered all our questions. They also have a Belize Museum facebook page you can follow them at and ask questions before you go if you're wondering just how to get there or when they are open. 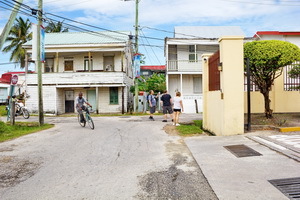 The rain did hold off and the weather got better as the day went on so we continued our little walk around the shoreline of Belize City passing a couple of the more major hotels and the Belize Lighthouse while we walked. Many horse and buggy city tours passed by us on our walk so we must have been following the scenic route. 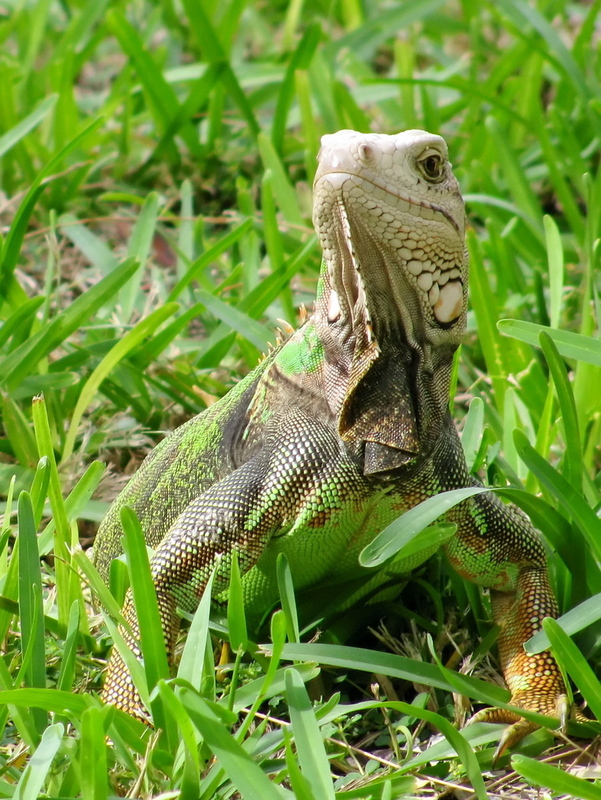 Take a tour or go for a walk in Belize. 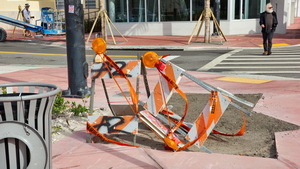 See more photos of the city and some of it's people in my Southern Cruise 2012 photo album when it's complete. 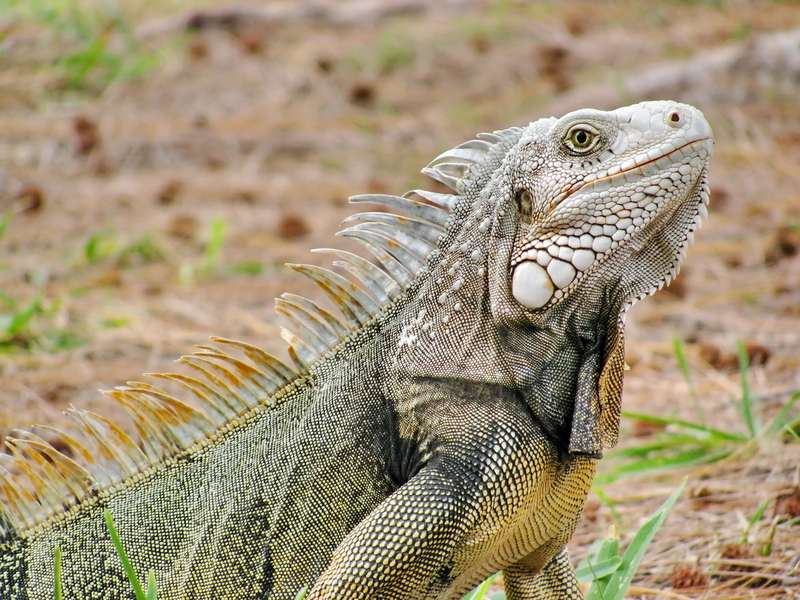 Roatan promised to be a far more tropical feeling port then either Belize or Cozumel and as we approached I knew I wanted to do more then just walk around Roatan's Cruise made beach and stores. The nights rain was still hanging in the air and steamy fog it left behind but the weather forecast promised a clearing a day and I decided to believe it and booked a catamaran snorkel and coast tour before we completed docking. 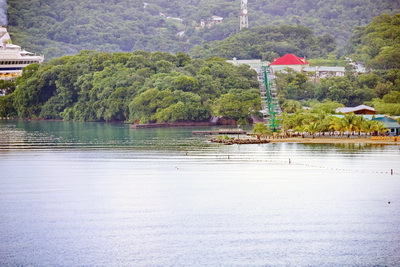 Roatan would prove to be the best time of the trip for me and my first time in this port I really loved it. I recorded a few of the resort names along the shores we passed on the catamaran for use at a future date. Maybe a quiet beach trip for two awaits in my future. We were to meet Jolly Roger Snorkeling reps on shore to head out for day. Once we arrived we headed right out to the dock and found our Jolly Roger Crew member about 30 minutes before we needed to set sail, so we did a little pre shopping before the sail. 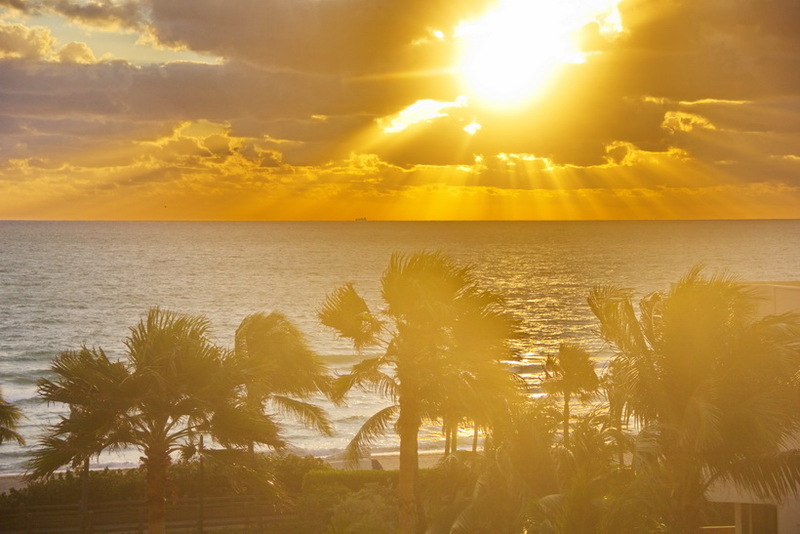 The sun started shine before we finished our shopping and sunscreen was finally needed by all!. Actually we didn't reapply this enough over the day as we all had some sort of burn at dinner later. Jolly Roger Snorkeling did a fabulous job. We were on their smaller cat, the larger more luxurious is pulling out ahead of us, but this cat did just what we needed for the day. The crew were incredible, they made the best lunch we had all week. Their heated island chicken tasted of citrus spices and was light and flavorful, along with the best cold pasta salad I've ever had and fresh melon and fruit this lunch would not be topped. As far as the snorkeling goes, there was lots of tropical fish and there is a coral reef here just off the shore where the catamaran anchored for a couple of hours. The guides were excellent keeping everyone in a safe area and track of all. They had a couple in snorkeling with us and a couple of kayaks that also watched over everyone and helped if anyone needed it. The crew did a good job of tracking everyone and keeping them safe and keeping watch. After a couple hour of snorkeling lunch was served and rum punch drinks were free from when you got out of the water. The crew kept everyone's glasses as full as they wanted, being stingy with nothing! Great service. 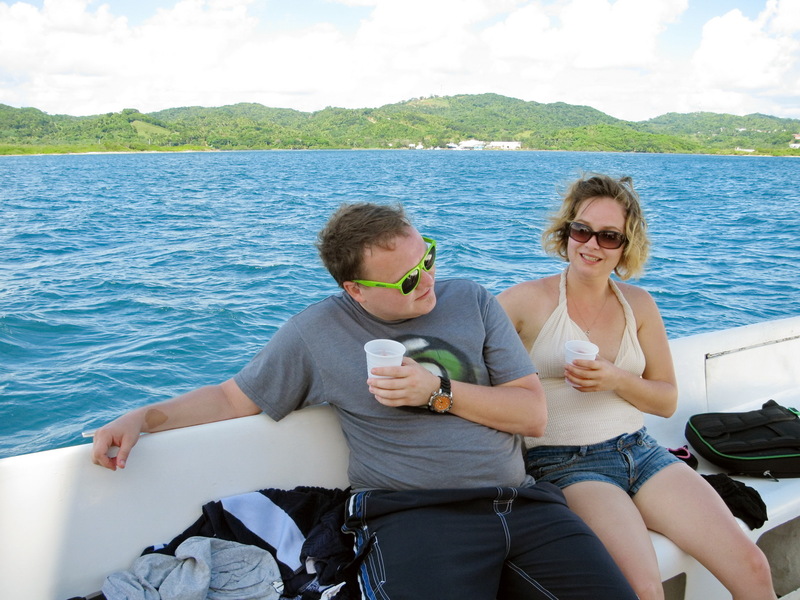 After lunch the crew takes us on a sail down the coast of Roatan where we were able to see some of the resorts and towns and houses of the locals (yes a definite contrast). The local children all swam out to the boat, apparently, hoping to get some soda tossed to them. This wasn't like in Mexico where they look sad or are begging, they looked like they did it for fun, one was in a row boat and about 10 plus children all dove in before we got to them. I was a little worried they wouldn't swim out of the way in time for our cat under sail but they cleared the way as our crew yelled to them all to do just that. One person tossed in a coke and I thought one of the kids yelled dad, so I asked if they belonged to anyone but apparently not. I was raised up on Georgian Bay and I can recall so many antics that involved taking off to the beach or dock without mom and dad knowing and what we got up to, I just had to chuckle, they really looked like they were having a good time. 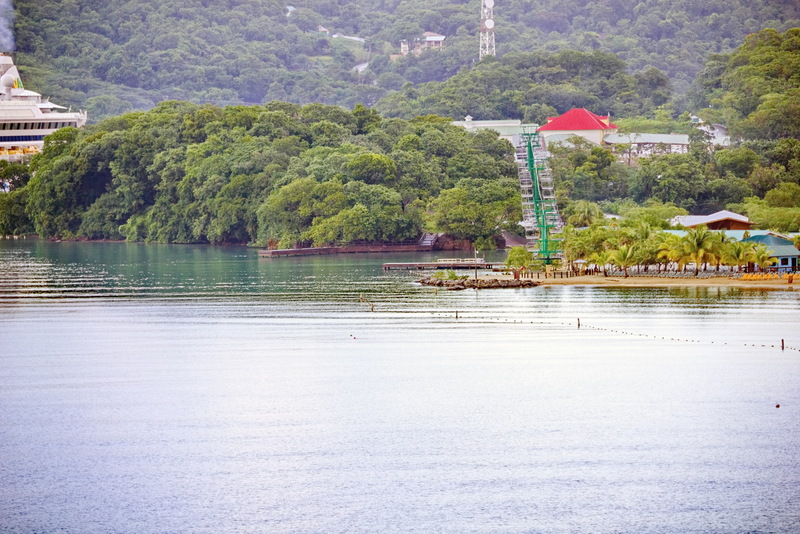 I really enjoyed Roatan more then anywhere this cruise, and I'll have more photos of the shoreline and some of the resorts we could see, and condos that kind of stuck out in the landscape in the Cruise South 2012 album. Jolly Roger Snorkeling gets a high rating from me. They made the day relaxed and enjoyable, just what one should have when they are on vacation. The crew tell me the cruise ships aren't in but one day a week at this time of the year and they don't have full time work on the Catamaran but they love every day they get to work on it. Roatan is somewhere I'll be sure to look up for a longer visit in the future. The crew did mention the main land of Honduras is not a friendly place and they feel fortunate to live on the Island which they work hard to keep safe form the crime that plagues the mainland. They want to keep their little tourist haven going for both the tourists and their own families comfortable life. 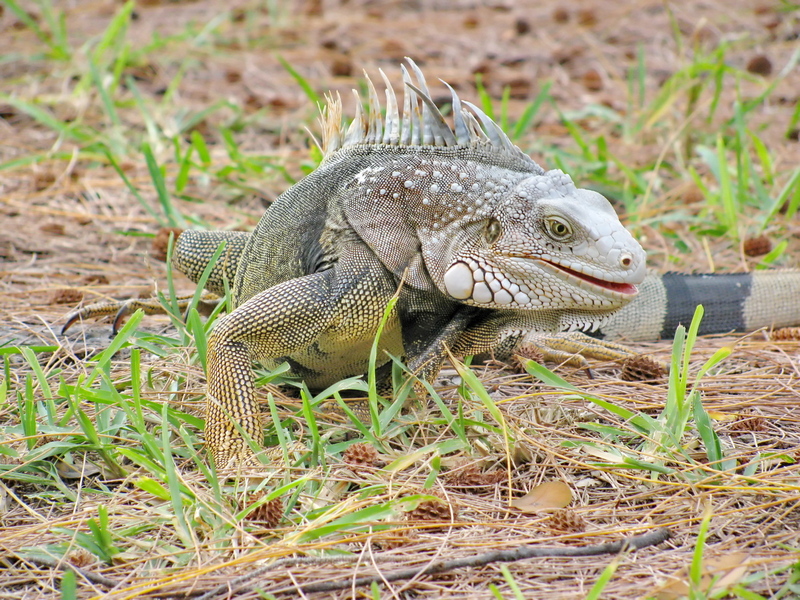 Be sure to check out the photo album for a little more of a slice of Roatan. 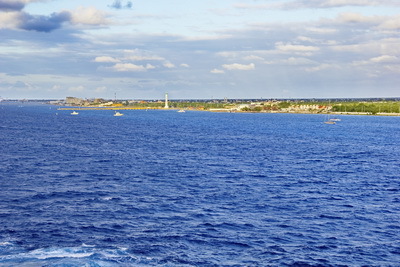 The stop at Grand Cayman Island looks like promising weather as we approach. I have been to Grand Cayman on several cruises now and as the first Caribbean waters I ever swam in it has it's own special allure to me. 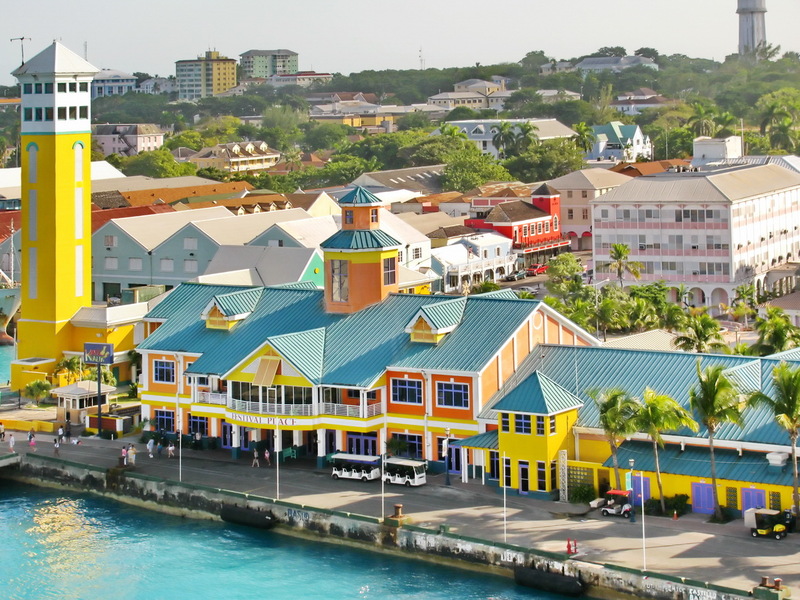 This is not an inexpensive shopping mecca but it is well built up, has lots of shopping in the Georgetown dock area that is not just the cruise shopping and has some beautiful, accessible public beaches. We ended up spending the day shopping. I got a great new purse from a store a couple blocks off the beaten path called Cache, at 984 Shedden Road. They had a great collection of purses and some great prices. I picked up a new T-shirt at the Hard Rock, Grand Cayman and I had lunch at the Hard Rock also. It was definitely better the cruise ship lunch, sad but true and you will find it consistent with Hard Rock Cafe fare anywhere in North America. It was a great Grilled Chicken burger and the waitress there was really awesome, actually. I couldn't decide what I wanted and she suggested altering a burger for grilled chicken and a salad. She must have been reading my food mind. Knew exactly the type of low fat fare I typically like to eat. 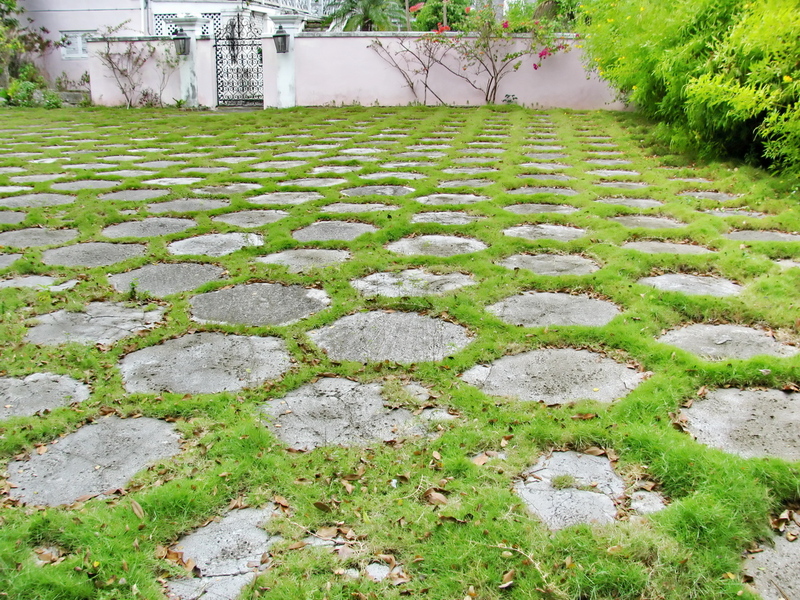 Have to say, Grand Cayman is so civilized. 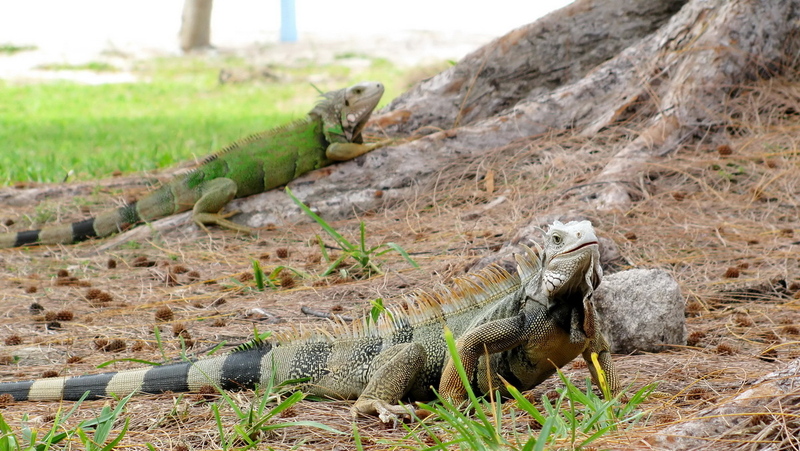 That is what I like about the Cayman Islands. 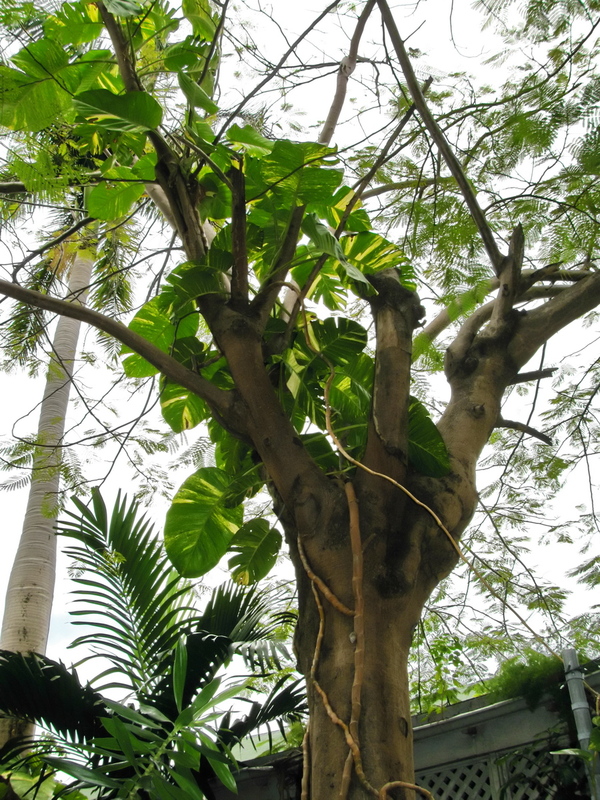 Tropical, civilized, fun. Well though I started a little negative with the cruise line summary at the top, the cruise itself was fun, as usual. I am just a little tired of the fun coming from what we make of the cruise and not what the cruise does for us for our money. I'm am sure the $5500.00 + that we spent on just 4 of us with extra meals and tips, would have purchased us a pretty sweet all inclusive holiday elsewhere that had staff bending over backwards to just make sure we enjoyed our time. This isn't my experience on Carnival Cruise lines where I find the crowds you have to travel in a bit tiring. This cruise over Thanksgiving for that price, for all of us together and seeing 4 ports in 4 countries in 7 days, is something special though. Can't do that just anywhere, but I can do it with another cruise line and will try a premium cruise line next time to see if that makes the difference. What can I say, Robin loves to cruise. 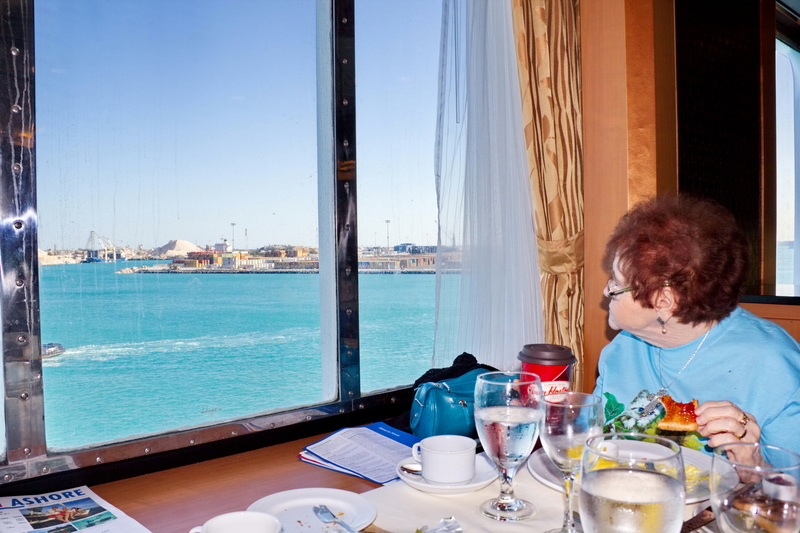 Love the variety of the ports, the feel of ship rocking and smells and view of the Ocean off your balcony or off the ships decks. The crew really try to give good service but they have 2000 guests to keep happy, not an easy task to accomplish making 2000+ (2800 this cruise with children) people happy, getting 2000+ people on board timely, off board for shore excursions and off the ship and through customs on disembarking day. You think it's bad at the airport with those 400 people on a large jet, wait till you experience this. The challenge to the cruise line to make this seamless just hasn't been quite managed by Carnival and I do think NCL and Royal Caribbean did a better job on those processes. Feeding 2000 people of different tastes on a boat can't be easy either, but I know it can be done better too and I'm a little against the addition of all the pay extra and get better food places popping on the cruises. Include decent meals or don't, but don't sell me a ticket at an inclusive price and then offer sub par food or let me pay for adequate. The steak house was a great meal, but at $45.00 a person (250.00 plus for that meal), I can get a mighty impressive steak meal on the mainland too. This on top of the fact that you don't have to feed 6 of us in the dining room while we eat here, that should be a $65.00 per person equivalent and I had to tip separately I was told in the steak house as my daily tips would go only to the dining room. The meal didn't wow me that much, a nice Brazilian BBQ on the mainland wows me far more and costs the same. The ship just isn't up to the same standard of service or accommodation one can get at a resort and the cheap, per person, per night price you hear advertised is far from inclusive and when you add on all the extras, it's no less expensive and can be more then a week at disney with the food plan. All this considered, I will still take another cruise as it's a special way to travel with own views, excitement and allure. Bon Voyage till next time. 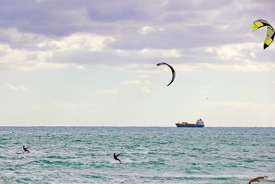 Leaving Port Canaveral - There is definite advantages for us to leave from Port Canaveral instead of Miami. Number one being it was only a 7 hour drive to the cruise dock. We chose to book an ocean front room for the night before leaving and take a relatively leisurely drive down. There was time in the evening to go for a walk, pick up a couple bottles of wine, now allowed to board with you on Carnival Cruises, and get a good nights rest before heading to the cruise dock in the morning. It was very unrushed. I highly recommend arriving the night before a cruise if you can swing it to make cruise day just a little less hectic. 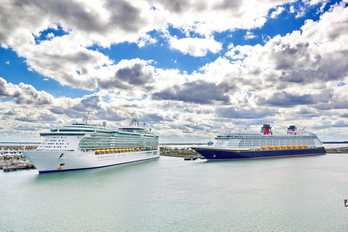 In comparison to Miami as a spot to stay, I can't say that Port Canaveral holds out the same charm as Miami did for us. It is not added to my list of places to spend more time at on it's own but for a port to cruise out of...It was close and easy access, making for a relaxing day before the cruise in the form of the shorter drive. The port is very industrial and not as scenic as Miami Beach but as you can see the beach itself is fine, taken as the boat pulled out of port to the Atlantic Ocean. 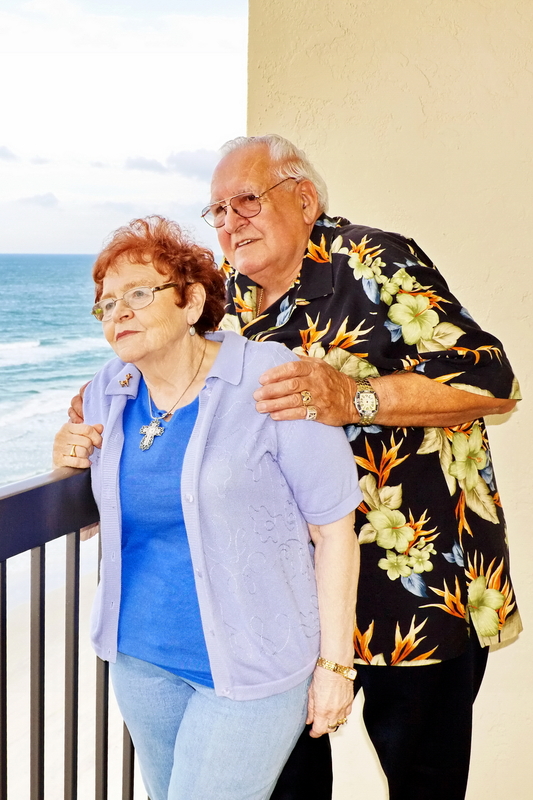 My parents loved the beach front balcony view from the hotel and their night's stay. Day 1 - Arriving at the cruise dock we all have to go through the Port Authority and security to board. We are allowed a bottle of wine each and a case of bottled water. This is something new, you used to have buy all your water on board and all alcohol. My mother purchased 4 little singles of wine but then was carrying on a bottle also which was my fathers. The TSSA man was not very pleasant and was quite confrontational when boarding. This is not the cruise ships fault but it doesn't make for a nice entry. The Port Canaveral Port Authority both boarding and exiting were quite abrupt and confrontational. I don't know if this is standard here, but we found them much friendlier in other ports we have left from, being Charleston, SC, Miami, FL and Tampa. This coupled with how often Robin travels (21 flights so far this year), and being used to courteous professional service from the TSSA, Customs etc, the abruptness at this port seems uncalled for and for that reason we may avoid it in future. The Customs person on arrival back to Port Canaveral was very brutal and it seemed to us the ship was bending over backwards to soften him up with coffee and breakfast before he had to deal with the people. I felt they were used to the brutality of these authorities and tried to prepare us for it making sure we had all documents ready in line, and were all organized, etc. It shouldn't be necessary for the staff and customers to be afraid of the customs officials and they should treat you with courtesy and professionalism as their declaration states on their forms and most do, in our experience, in other areas. An older female supervisor did help greatly on boarding when the security man yelled at my father accusingly after the metal detector went off with a "What do you have?" He had done the same with Robin when he set it off but Robin being familiar with traveling realized quickly he had forgotten to take off his watch but my father's didn't go smoothly and I thought after a bit of a confrontation they weren't going to let him on board, but the supervisor came out and diffused the situation. I bet she has to do that often for this particular agent. Once on board things were smooth enough, the buffet was open, the slide ride running and we could sit and relax on deck. We were also able to get to our room immediately on boarding, though, some wouldn't be able to. They let you know what time your room will be ready. Our room was ready for 1:30pm and it was 1:25pm as we boarded. The cruise ship had no assistance or wheel chairs available to my mother when she realized how far the room was on board so do be careful. If you might need assistance of any nature make sure you arrange to rent a chair or bring one with you, or walkers you might need. I understand from speaking with a few other seniors that if you are smart you can prearrange to rent assistive scooters and devices in each port. My mom walks everywhere but has Rheumatoid Arthritis that can cause her pain and tries to be careful how much she does in a day. On the cruise she tends to over do it wanting to see everything and letting her desire to shop and see it all override her common sense about what she can handle pain free. All in all boarding was fine and we made it up to the deck for a snack after unpacking our luggage in what was a very nice double port hole room, which we were given as a no fee upgrade from an inside room. As a comparison to Day 1 in Miami leaving on Norwegian Cruise Lines in December, I give Norwegians departure a higher mark. It went smoother, authorities were nicer and the the NCL staff were actually present to give information and just seemed friendlier as we boarded more so then boarding this cruise. 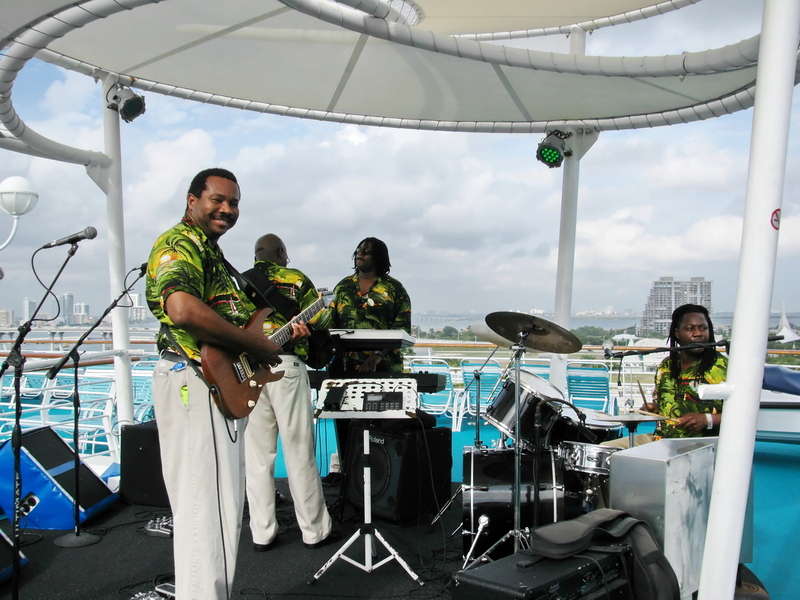 There was also bands playing and a few organized activities set up for departure day and some services open on NCL that were not on Carnival until we pulled out of dock. Cruise Food - Food aboard Carnival's Sensation was adequate but again, not the quality that was present on the Norwegian Sky in December. This is kind of huge for me as I had previously felt Carnival Cruise service and food was above Norwegian and as much as Norwegian surprised me with the quality upgrade on the last cruise Carnival just wasn't meeting the NCL standard shown on the Sky out of Miami, on this boat. I will let you know if I find the same standard on my cruise booked in November out of Tampa on Carnival. Breakfast - We had breakfast in the dining room the first two days as I prefer sitting down over having to fight for a space at the buffet and the crowds at the counters. The service was adequate the food was adequate but nothing spectacular. Eggs Benedict was made their way, not quite what my father, a chef by trade, would have served. He found it a bit messy, the english muffin a bit stale, and egg not quite cooked to standard. My mother wanted a mug but as is standard, bring your own mug if you don't like the tiny cups. I gave her my Timmie's mug the first day but took it back after the first day. If you recall on an earlier cruise when I hadn't brought a mug I did go buy my own to fill with coffee and walk around with. I also brought a water bottle to fill with Orange Juice in the morning and keep in my fridge so I'd have something to drink later in the day but as I was allowed to bring on bottled water on this cruise that wasn't so important to me and I only actually filled it one day. But if you like your OJ with lunch instead of breakfast, do bring something to take it with you as it is only served in the morning and lunch just has coffee, tea or water available at not cost. Orange Juice would have to be purchased in a small overpriced glass from the bar. The one day we went to the breakfast buffet I went simply to see if they had any better quality food up top at the buffet then in the dining room. 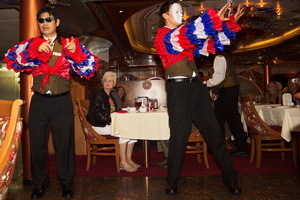 I had loved fresh omelet stations on NCL but Carnival's omelet station on this boat did not live up to Norwegian's. There was what appeared to be a form of assembly line to make an omelet unlike the chef's that made NCL's. The quality control and pride in work didn't seem to be there. One guy threw in a bunch of oil, passed the pan to the next guy who stuck it to heat up, and asked what you wanted in it. There was only about 6 items to choose from where NCL had 20 or so. Then your pan was moved down to the next guy who added the egg mixture and then passed it down again and the last guy finished it up, put it on your plate and no fancy flipping or friendly banter. This ship did seem to lack in staff knowledge and banter. Our room steward was great, as usual but his boss came and told him to move along one morning when were asking him some questions. My mother LOVED the casino staff from India and had tea with them one evening after closing and she believes many on the ship are being trained and only on this ship for 2 months. This could explain the staff issues we found. Possibly this ship is used to train the staff and give them their first taste of working for a cruise line. If this is the case many will serve only once and not come back when it's not what they expected. Others will move on trained and be far better then the learning curve we saw. Lunch - Each day I had lunch at the buffet. It was just easier to come back from our shore excursion when we felt hungry, eat and then go do what we wanted for the rest of the day. There is a fresh deli spot where you can get a sandwich made. The fellow working here when I went was in training and seemed to have a difficulty understanding what I wanted, then had the most annoyed look when I asked him to correct the sandwich. I understand there is language barriers for the staff when training and understanding the clientele when they are not english as a first language or the language being spoken, but I hope the first thing they are taught is to be gracious and empathetic when mistakes are made. Lunch over all did not have as many choices as NCL had or the fresh options found on NCL. The carving station served a different roast each day. Beef one day, lamb (my favorite) another, turkey one. All of the food from the carving station tasted fine. The Lamb was good, surprisingly, the beef was sometimes a little grizzled but good for the most part. I did note that each day the same fellow had to serve me, was NEVER standing at the carving station and someone would call to him (this was at standard lunch times, between 12 and 2pm), and he would slice the thinnest pieces. I'm not a huge eater and each day I would have to ask for more please and he would slice a second very very small thin piece and I would say, I'm a HUGE eater or this is for my dad, he's a big man, more please. Slowly I would get what I considered enough lol. I did this for each plate I was getting in a day and every day I was on board. I felt he should remember me just for that but never.. I always had to ask for more twice. If you wanted burgers and fries there was a steady line there and lots of happy customers. Dinner - Our dinner wait staff was good and the young lady (Lola she said) that looked after our table was not new. She did have wry sense of humour that occasionally caught my mother off guard but I appreciated the sense of humour. She was over worked at times and had to stay organized to keep up. It was very difficult to get a planned seating. We could not get it when booked and had to ask when we got to the ship if they could give us a planned seating. I really don't like the come when you want system as, especially on sea days, it can be busy and lined up at the time you want to be seated and I have twice seen them turn people away with an apology and ask them to come back later. This, I am told, should never happen, but as I said, I have seen in and experienced it myself and just want to know when I'm being served and where I'm sitting. It turns out, everyone I spoke to on board had wanted a planned seating and been disappointed they couldn't get it. I did not see a problem on this particular cruise with people being turned away at dinner though the dining room was very busy on the one sea night. 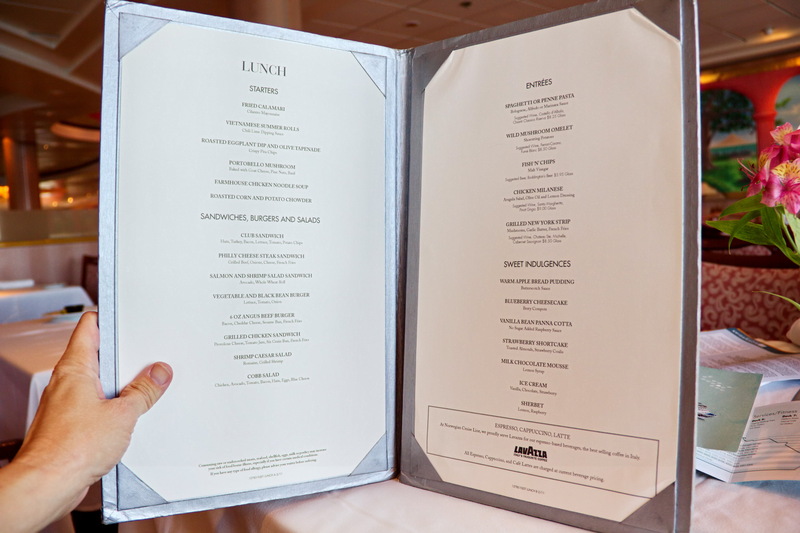 I do not know who the people are that desired the dine on your own time so much they implemented on many cruise lines now, but my own unscientific survey, says, some people want it but the majority did not. Food itself was again okay, but not fabulous. The diet Key Lime pie was just scary but I did indulge most nights in the sugar free desserts to see what they were like and the rest were good. I also chose the health fare picks on the menu each night and I found all tasty and edible but not spectacular. The grilled salmon was my favorite and I had my dinners with steamed broccoli each night. My review of the food includes the opinions of how other people I spoke with my family reviewed their own dinners. The steak was a better quality then I was served on NCL. I was pleased with that. It was an inch thick sirloin, about 6 ounces and juicy enough though maybe not the most tender. It is always nice to know that your food is going to be cooked, be decent and included. For that I enjoy the food served. If I was heading to a gourmet meal these would not be high rated but they are good. Dinner was on par with the NCL dinners. My family were not overly impressed with their dinners, they did not oooo and aaaah about them but still enjoyed then well enough. I suggest asking the server what dinner and dessert they recommend for the evening as each night one did stand out as better then the rest. 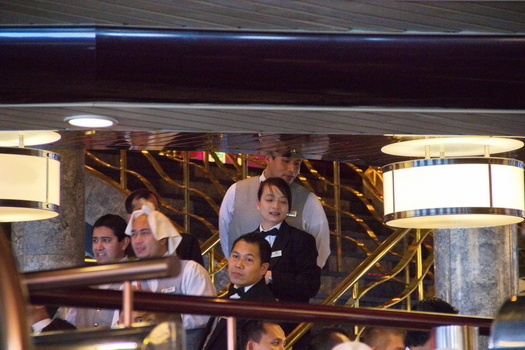 On my next cruise, in November, I'm going to take some photos of the dinners and give a better idea of what is served. 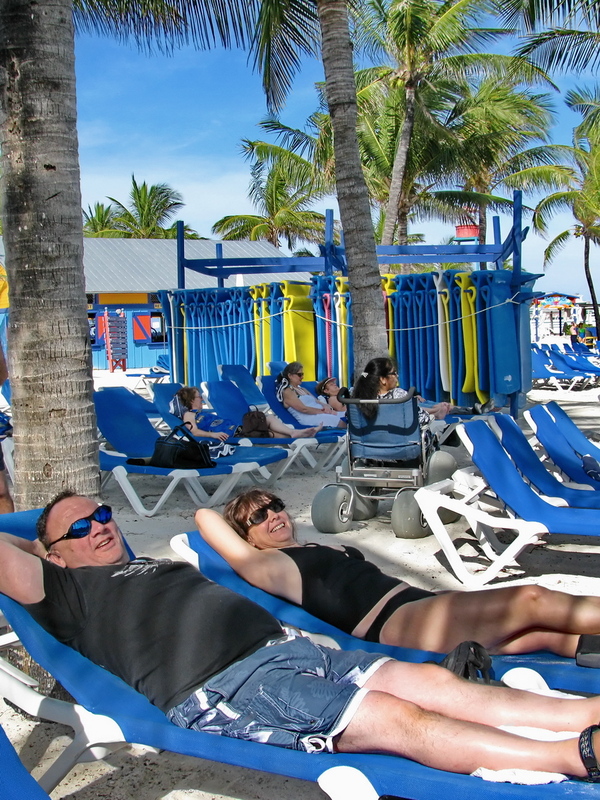 Freeport, Bahamas - Well the cruise, out of Port Canaveral runs to Freeport and Nassau. I've been to Nassau enough times but Freeport is somewhere I hadn't been. 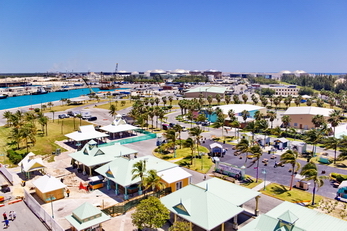 Freeport is an industrial port. I quite enjoyed looking at the ocean liners coming in and out and the industrial activities in the port, but to get to any shopping or activities it was necessary to take a taxi from the dock to town. 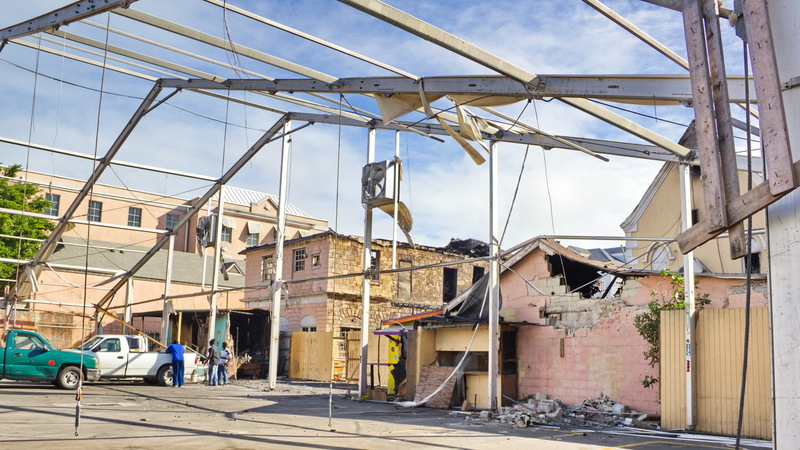 I went to a small tourist spot, Port of Lucaya, with some shops and a marina, but had really wanted to go to the main town to check out the shops but the Taxi driver we asked for information from didn't seem to understand our request and that's where we ended up. It was fine, we shopped and looked around it for a couple hours and found a taxi home. Be careful what taxi you take. We took a taxi on our own and it was the $4.00 the cruise people had said it would be but when we wanted to come home he had us waiting 45 minutes hoping more people would show up and trying to see if more would come when asked. It was early, we had come out at 10am and it was just coming up for noon when we were heading back while most were still just arriving for the day. The fellow offered to take us back with just us if we could pay more, like $27.00 and we just said, don't worry we'll come back later. We walked around the corner, along a few shops and there was another taxi spot taking tons of people home no problem, right away. 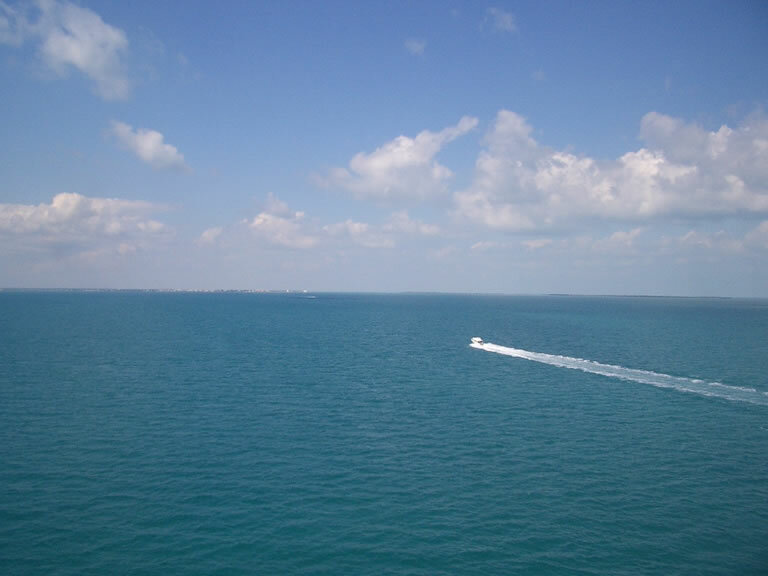 We paid our $4.00, went back to the boat and didn't bother going back in to Freeport that day. We played mini golf on board, used the slide I'd been dying to try, had one of those icy sweet drinks (strawberry margarita), and took a nap. It was a great afternoon. See photos of the mini golf and water slide in the photo Cruise 2012 album. Nassau, Bahamas - Day two was a stop at Nassau. 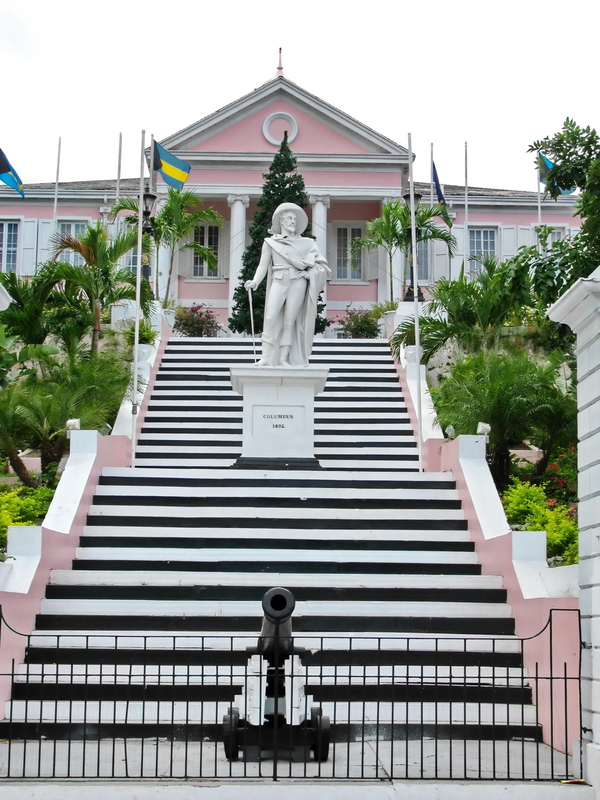 I've been to Nassau so many times now I had a pretty good idea of where I wanted to go and what I wanted to do. The hope was for Robin and I to take off to Atlantis for a day of fun but again, as in December, the weather wasn't warm enough for our liking. It hung in the 70's for the day. Great walking weather but not what we consider great swimming weather. This just gives us one more reason to take one of these mini cruises again. 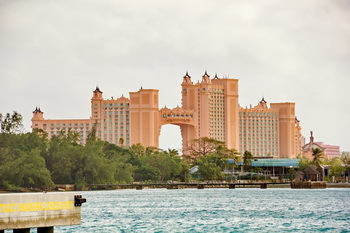 We will get inside the gates of Atlantis and ride some slides other then the one on the ship next time we hope. Shopping with my mom and dad was a lot of fun in the morning. My mother had to get her shopping fix and pretended she didn't hurt, but she has agreed to let us see if we can rent her scooters for the next cruise or at least bring her walker. I think she'd love being able to go from store to store on a scooter and have no worries of pain accept from getting off it to run round the shop. We probably walked 2 miles over all with her and she hurt for it later but had a fabulous time. 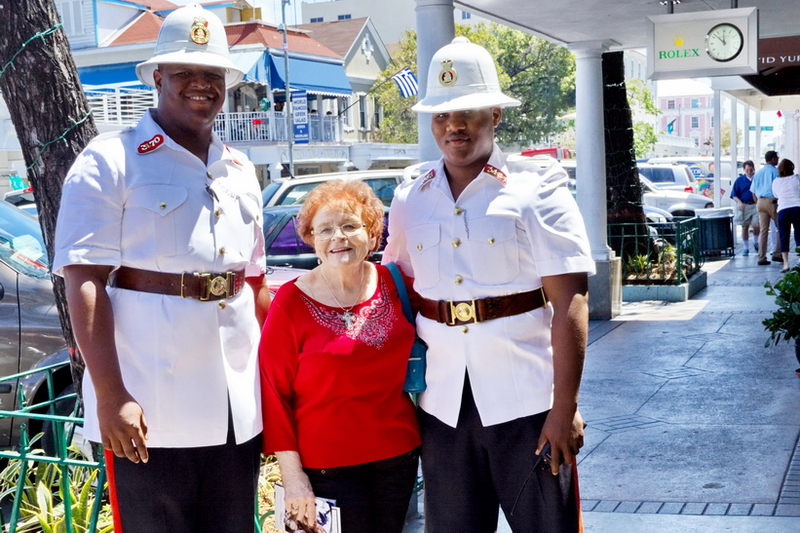 You can see above that two nice bobbies couldn't resist the red headed Scottish accent and posed with her for a shot. That was so nice of them. We all returned to the ship for lunch. 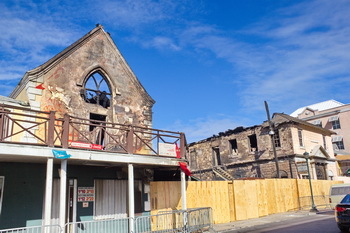 After lunch Robin and I went out to explore the areas we hadn't gone in past. 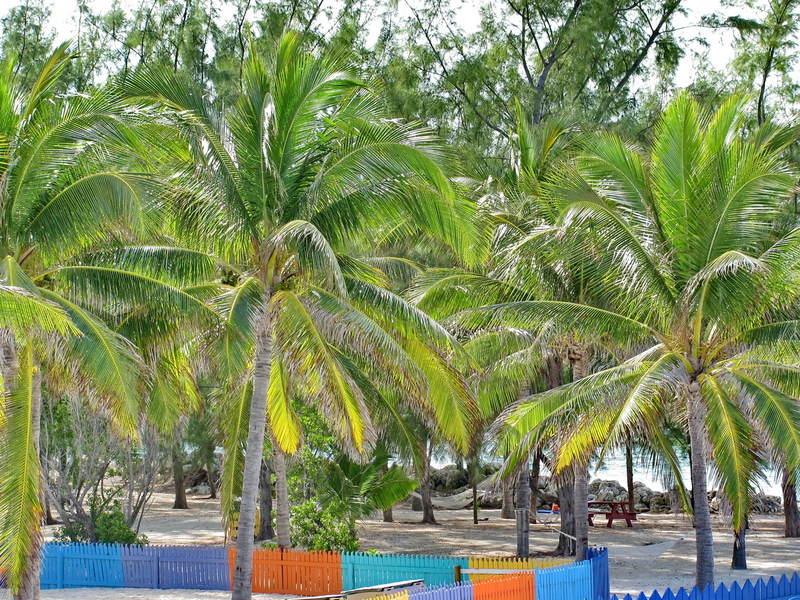 We went right off the ship and found a wonderful beach (Junkeroo Beach) just past the shopping area along with a Fisherman's Wharf area full of great smelling seafood restaurants, and we went through an old fort, Fort Charlotte. 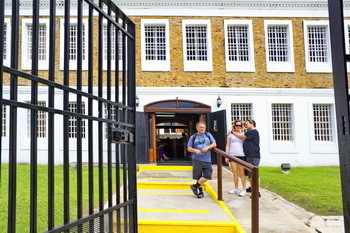 Fort Charlotte offers guided tours and was an easy enough walk for us. 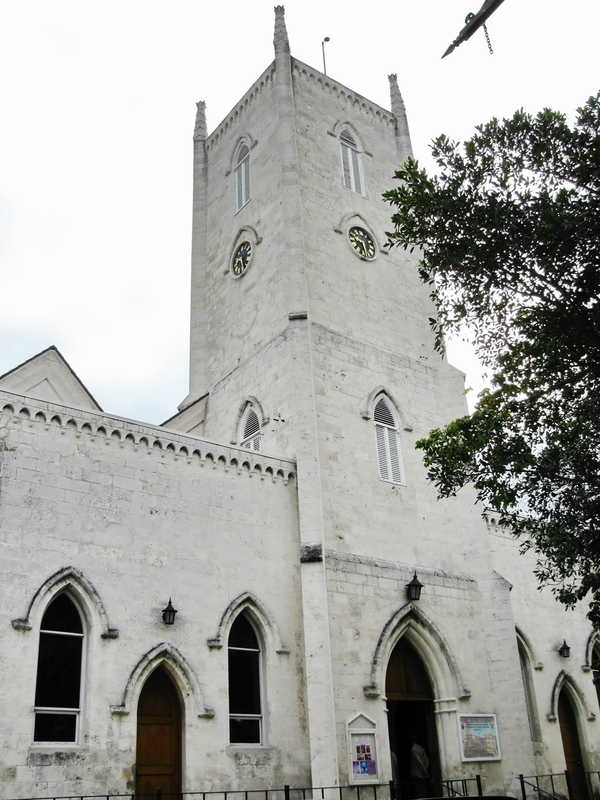 It was a fabulous afternoon just exploring the port and there is so much to see and do in Nassau. 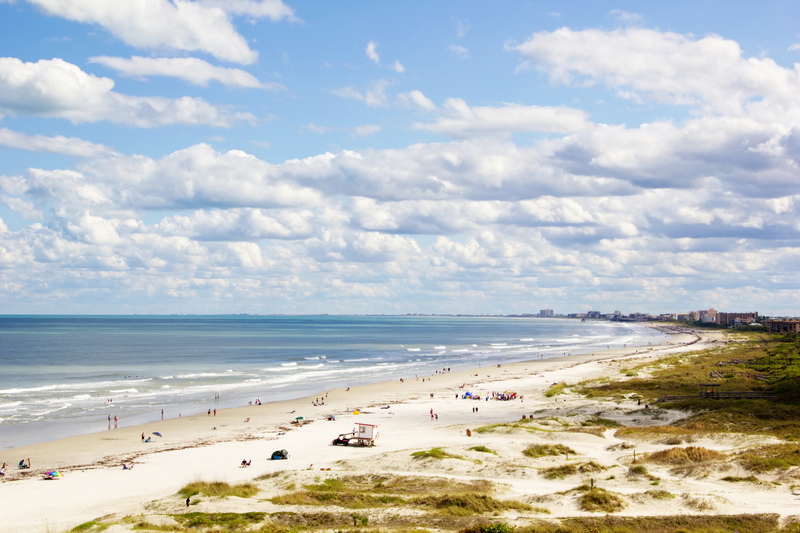 Next time we think we will head to the beach and hang out for the day with a pitcher of icy drinks! The beach drinks were much cheaper then the cruise ship. So next Nassau stop... the beach and Atlantis. Maybe we need at least two more. 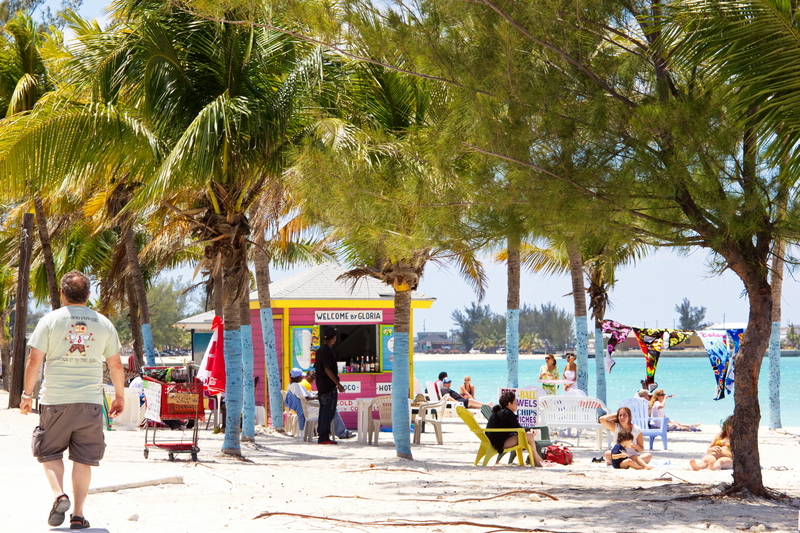 Go explore Nassau next time you're there or lay on a public beach where you'll see the local school children stop by on their way home from school in uniform. The flavours and smells of the Bahamas are many and even after you think you've seen and done it all I'm sure you can find something new. Give it a try. With a full day done and a day at sea to go still for the ride home we ended with a typical beautiful sunset the night before we were done and arrived in dock as planned on Thursday morning at 8am. The departure process for non US citizens meant we had to go to get stamped from Customs for our non existent purchases prior to the boat being free for disembarking and we had to be there at 7:00am so it was a very early breakfast, show up to the customs meeting and then we were able to head off the boat as part of the self disembarkation process. As we were on floor 7 (the floor that disembarks) our floor was called first and we were off the ship and on our way home by 10 am. It was, as usual, a great and inexpensive way to get a mini vacation. Cruises are a terrific way to get a taste of a lot of different ports for a very reasonable price. Comparing the food to what I might eat in a strange country and port at an unknown restaurant would very likely move it up a few notches. Don't be worried, take a cruise, there's lots to do, you're sure to enjoy it but knowing the surprises and little hidden costs and annoyances (drinks, daily 10.00 each in tips, on board account instead of cash), will make the first one all the more enjoyable. Lunch Time - Cruising has come a long way since my first cruise back in 2004. 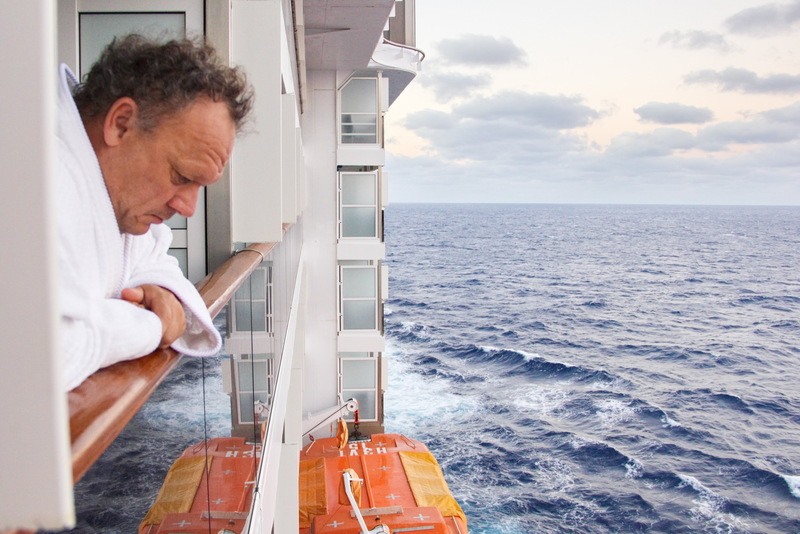 The first cruise I ever boarded was a bit of a nasty experience. There was HUGE lines it took 2 to 3 hours to get through everyone waiting. We showed up at 10:30 am (back in 2004), with notes about not being able to start boarding procedures until 11am and it was just a night mare. Carnival couldn't start the boarding as scheduled, people were all squeezed in to one room, lined up and waiting with all our luggage on a hot Florida day and hungry. Customs was slow when they finally started and before boarding Cruise staff had to take credit cards to cover tips or cash and it all took so long and was so annoying, then when finally after hours of waiting we got on board, nothing was open, no food was served and there was no entertainment until you set sail. 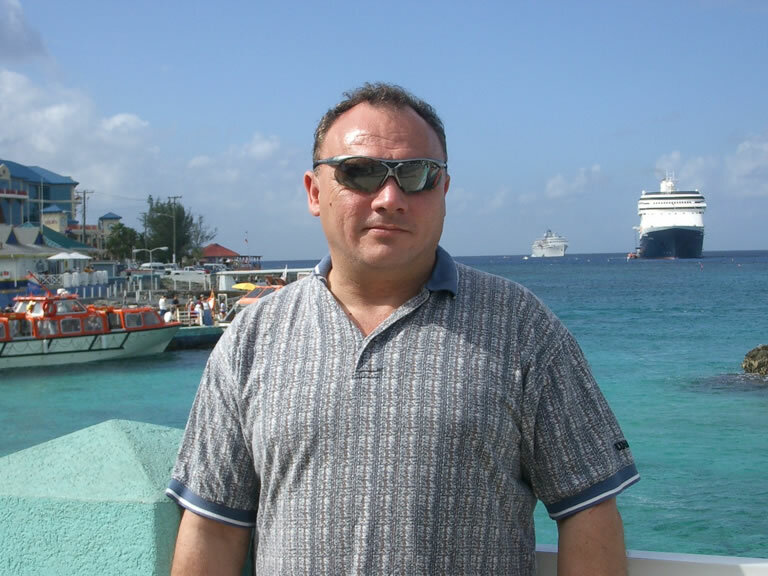 I had serious doubts on that first day I would ever be able to enjoy the cruise enough to make up for the boarding hassle, but as my story in 2004, Cruising the Caribbean, attests to, I did enjoy the cruise, just not day 1. Day 1 was just as bad on the next couple of cruises, but that's all changed now. What a great day. The weather was just perfect for walking and the rain held off all day while we walked and shopped. Time to head back and get dinner on our last night on board the Norwegian Sun. These 3 night 4 day cruises really are a great way to get a relaxing mini vacation to see a few places very inexpensively. 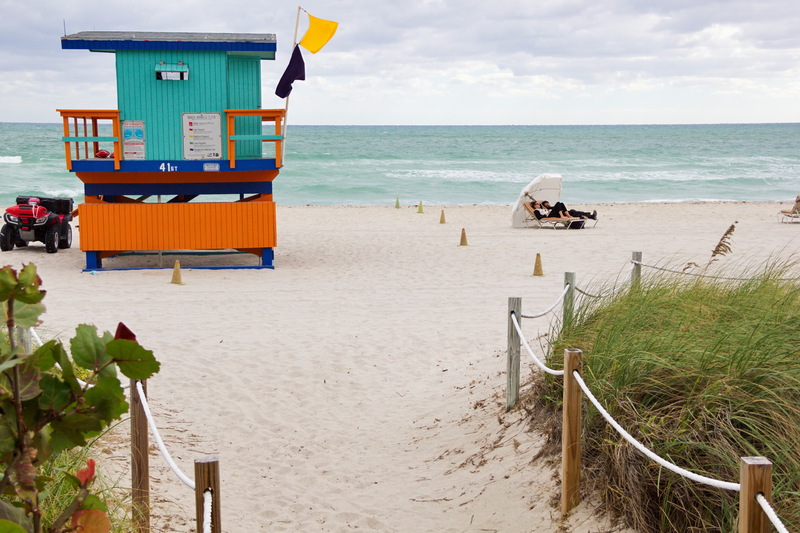 The add on of a night in Miami just added to the enjoyment. Nothing left to do but have dinner and get to sleep ready to depart early tomorrow and head up to Canada for the winter skiing after my mini warm up. 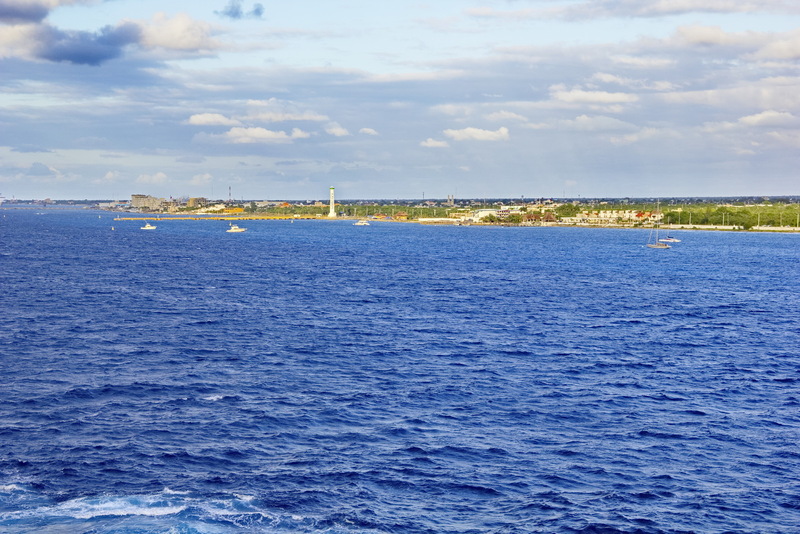 3 Night Cruising with Royal Caribbean from Miami, It's Better in the Bahamas. This Royal Caribbean cruise set sail from Port of Miami, above, just as the sun was setting giving the beautiful orange skies behind the skyline. What a nice setting. We arrived for our cruise very early, which seems to be our tendency on such things. Royal Caribbean, unlike past cruises did not have a policy of making everyone wait to check in on board but at noon was ready to start accepting passengers on board and we could go to our rooms with our luggage right away. What a pleasant surprise. 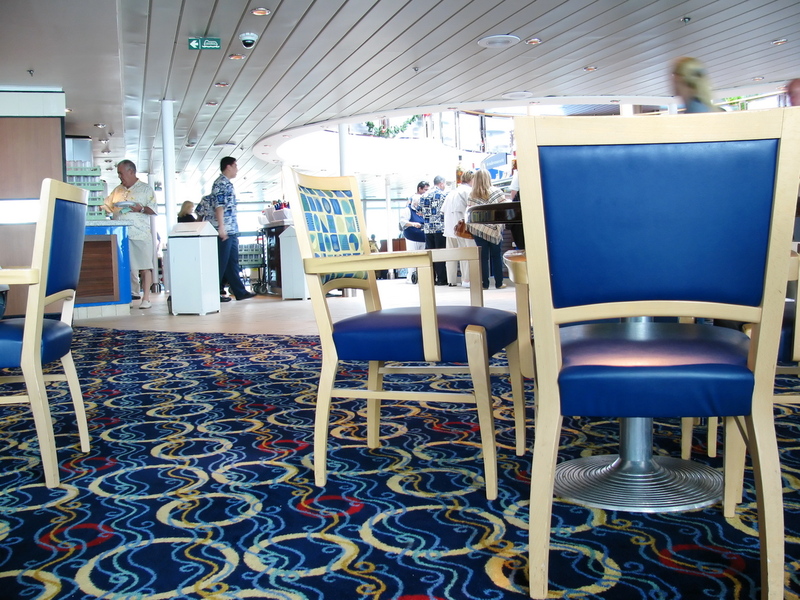 Until now, the standard on other cruises was to sit in a hard chair until approximately 3 hours before the cruise time, then line up with 100's of people to go through their staff and customs before boarding. Usually, upon boarding, our cabin would not be ready and we would be given a time we could get into the cabin with our carry on luggage. The seamless boarding made this my most pleasant cruise day 1 so far. So arriving at noon, we were allowed to wheel all of our luggage on board with us. We did not have to pass it to security and have it delivered later. 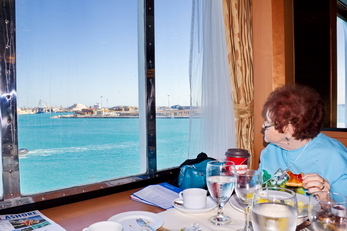 We wheeled it straight to our assigned cabin, and we were up enjoying lunch in the buffet on the top deck by 12:30pm. 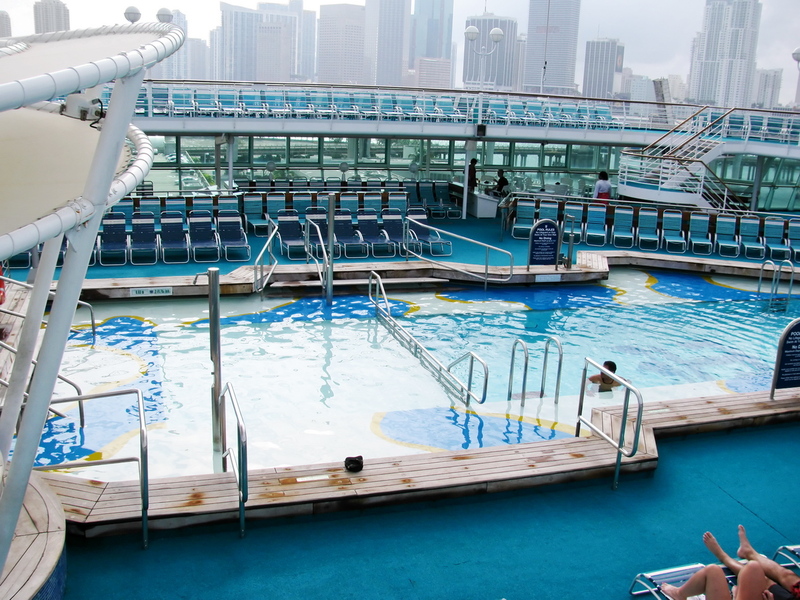 The other standard on the Royal Caribbean Cruise, that was not standard on NCL or Carnival is the pool and hot tubs were open. These, on my past cruises, have been empty until we were out at sea. 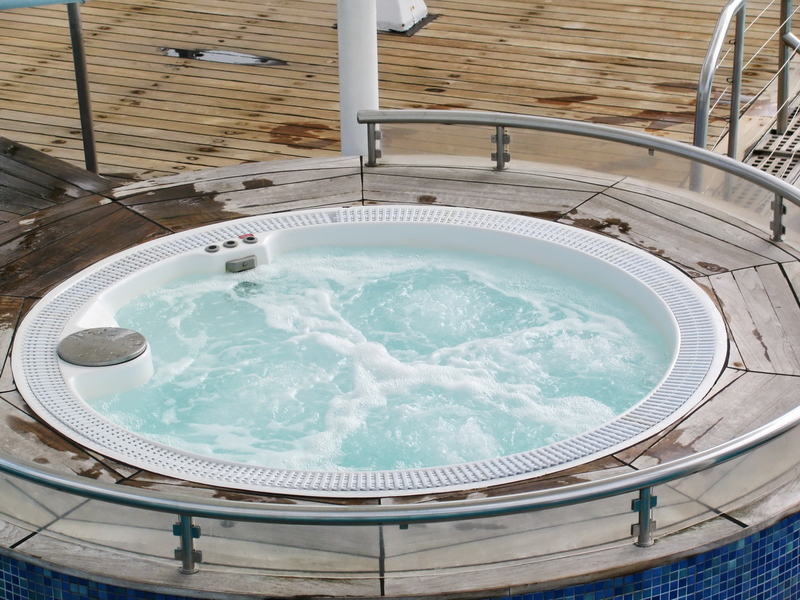 All guests were welcome to listen to the live band, eat at the buffet, enjoy the pool the hot tub and attend some shopping news seminars in the theatre, all arranged on Day 1, prior to leaving the port. Day 1 ran very much like any day at sea on a typical cruise and by 1pm, Robin and I were enjoying the sights of the port and I felt my holiday had already began. 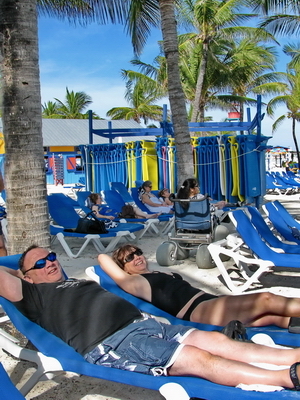 Saturday morning, bright and early, we pulled into the Royal Caribbean owned Bahamas Island of Coco Cay. I had heard many complaints about Cruise Ship owned Islands. Most complaints relating to the money for shore excursions and the Island being a way to grab more money for themselves. Well, this may in some way be true, but I found the experience very enjoyable. 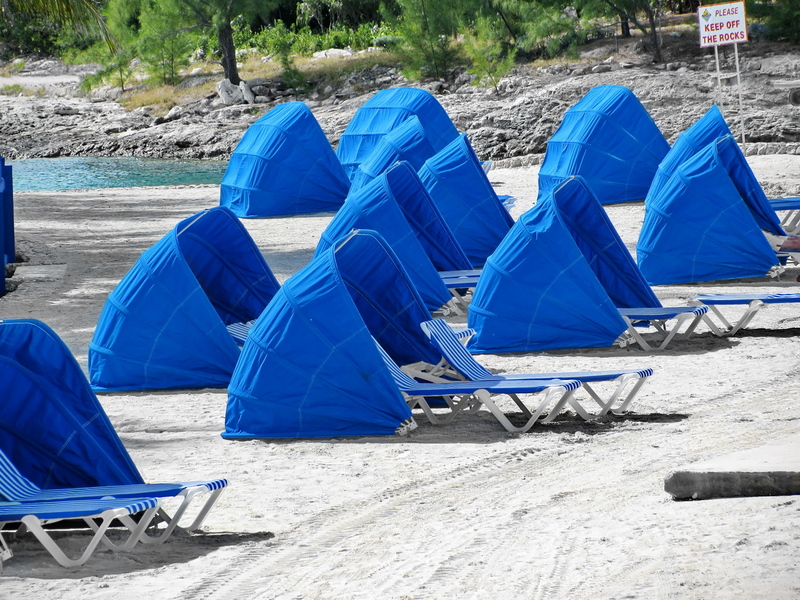 The cruise line had many different styled beaches and rest areas for us. There was a sunny beach with tents set up, a beach with chairs laying under coconut trees (Robin made sure I knew they were directly over my head), another with a large, free children's water park (floating trampoline's, teeter totters, etc), for use during monitored time slots, and shady picnic areas with hammocks or picnic tables to loll around on. 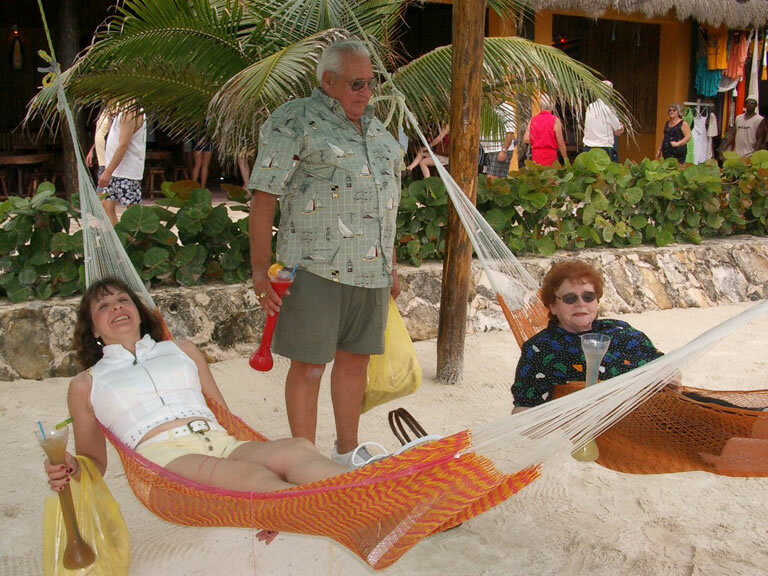 Robin and I chose to hang out under the Coconut Palms and I actually managed to get Robin to lay out and relax on the beach for a couple hours (below).As far as a money grab goes...Not a soul approached me to buy a shore excursion, drink or spend any extra money on shore. There was a very small vendor section where a hat, t-shirt or sunscreen could be purchased from what appeared to be Bahamian vendors, not cruise ship employees, and lunch and non alcoholic drinks were supplied free of charge (a nice BBQ), by the Cruise line so we did not have to return to ship for food until dinner. 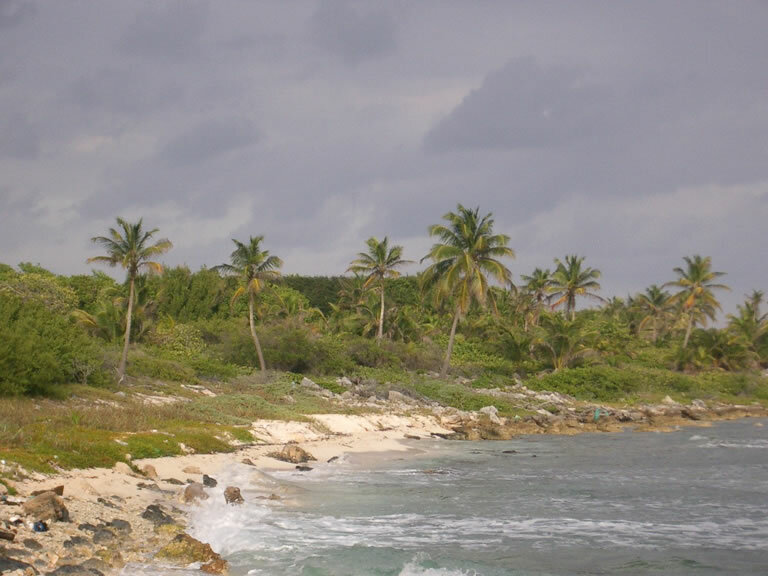 We did a swim in the beautiful Caribbean waters and then a nice walk of the Island. 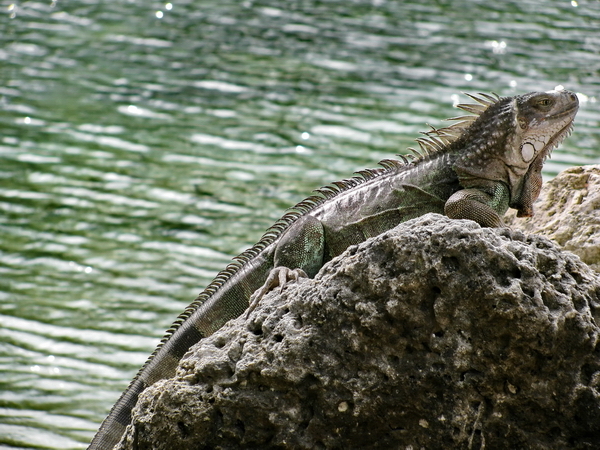 My favourite part of the island was Iguana Lagoon. 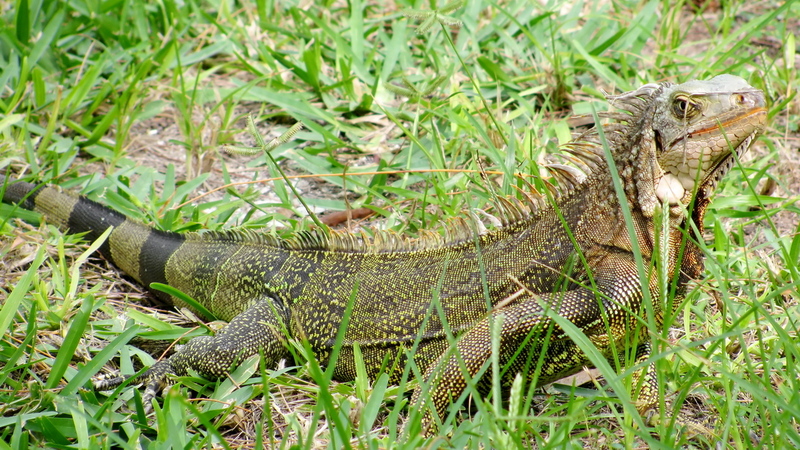 These creatures were very tame and 100's wandered over this area of the island. 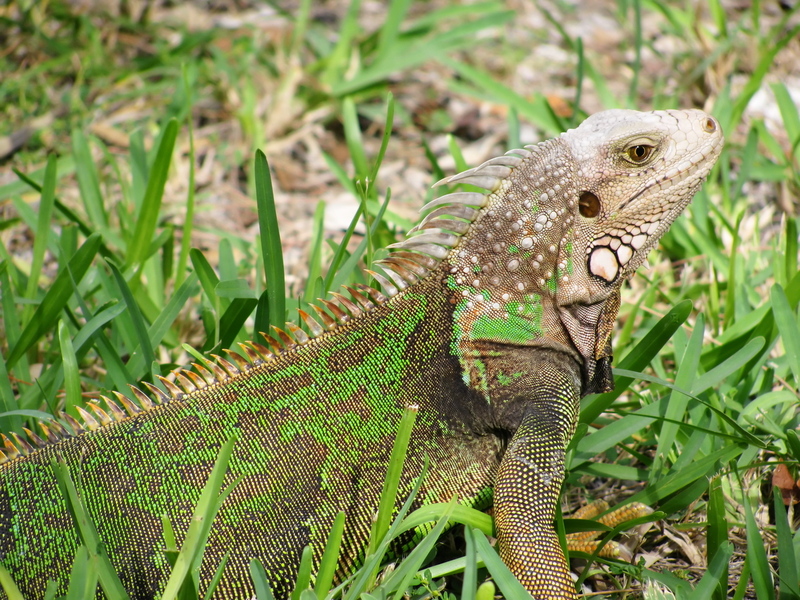 The many colours based on their camouflage to their current environment was just incredible and the one large iguana picture shown here, in the exact hues of the lagoon, even to where the sun shines off the iguana's back was stunning to me. The iguana's posed, stopped to be fed fruits and had no fear of coming up to people to accept the fruit being offered. 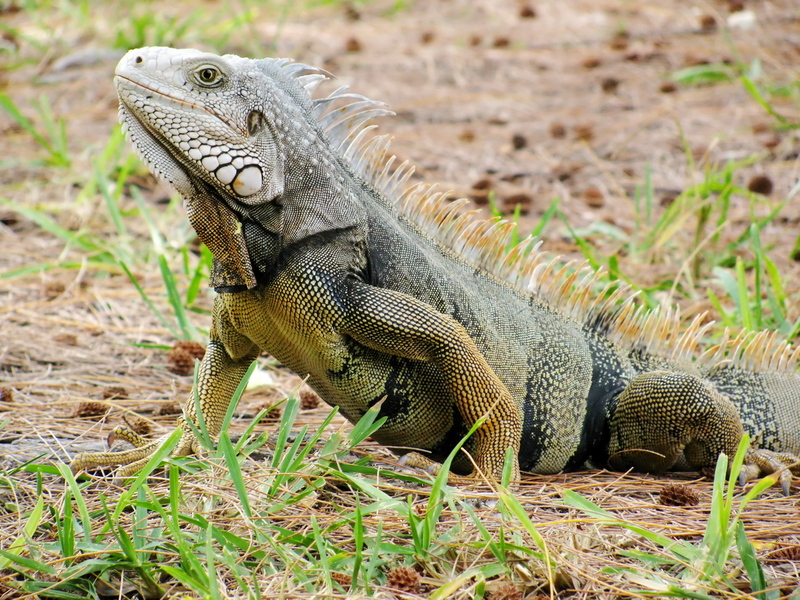 You can click the row of thumbnails below here to get the larger versions of the iguanas if you don't want to go view all the cruise pictures in the Photo Album. Above photos and a couple below are available for sale on I-Stock. Click for sale link. 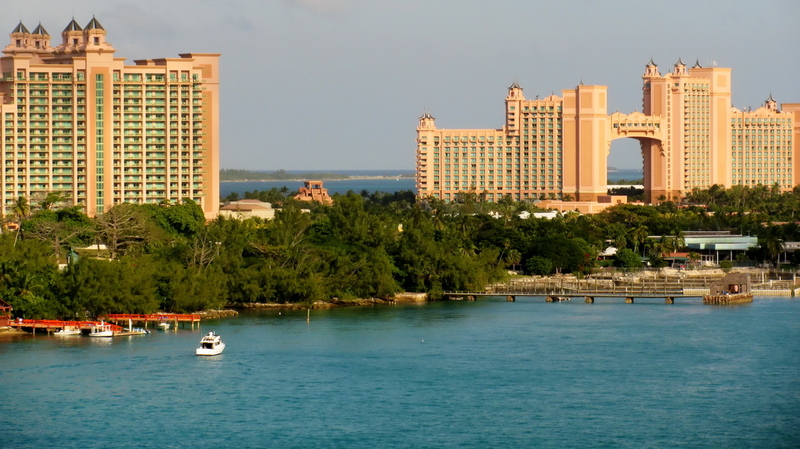 Well on Sunday morning we arrive in Nassau for a day of shopping. I found a great little designer boutique off the main street where I picked up a Donna Morgan original dress at Cole's of Nassau on Parliament St. along with matching shoes at 70% off. It was a wonderful store and definitely worth a look if you are interested in high end, true designer clothes. I could probably find similar pricing on line at a discount but it was a great buy off of the many clearance racks in the store. Other then this store I did all the usual cruise ship stores, picked up all my free (not really free, I purchased a coupon book on the cruise ship) items, and just did a couple hours of walking and seeing the buildings and sights when we first arrived. We arrived at 8am and went on shore, though the stores do not open until 10am. 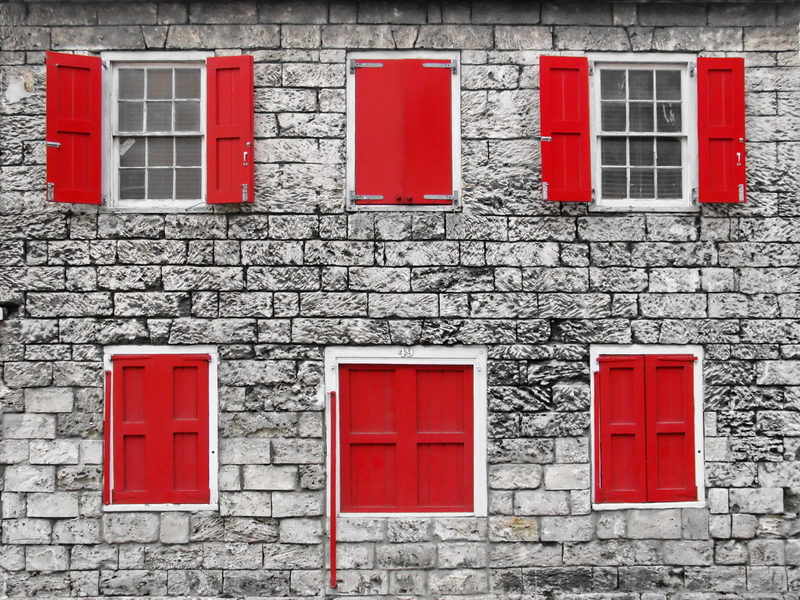 Nassau is a real mix of architecture and past history. The churches had a spanish flair, the parliament buildings have a british flair though they are in bright pinks, and homes were very english sea side looking, with varying bright colours. The spanish influence from Christopher Columbus is apparent but the huge british influence is the most apparent. There is a British styled government and they even use Bobbies for Police. 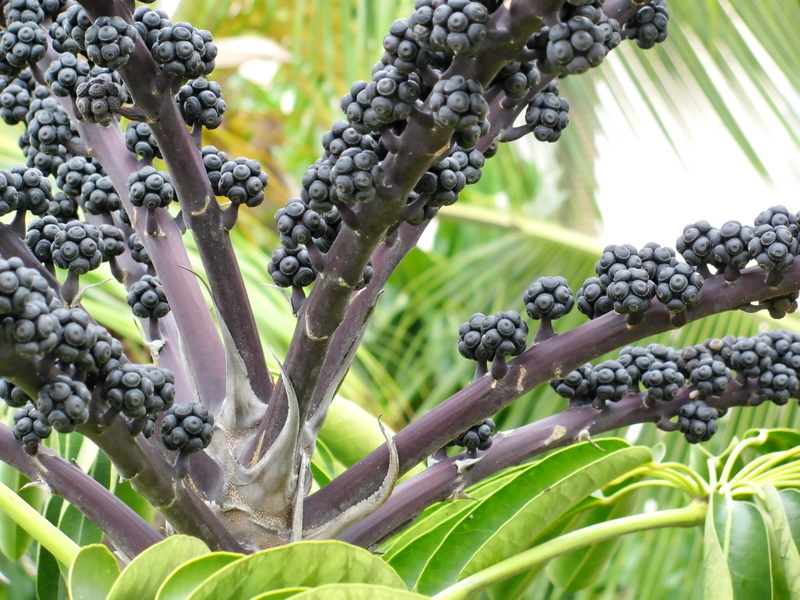 The tropical plants and and fauna are beautiful, adding real flair to a typical english garden. 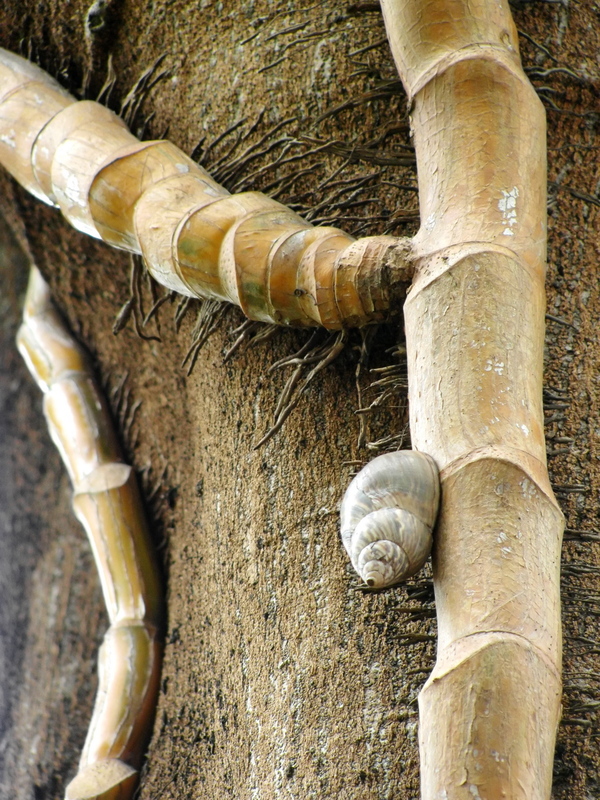 This huge fist size snail was found on a vine growing on a tree in one such tropical garden. This is a tourist destination and you will find all the tourist traps. There is Atlantis built across the Bay, Horse and buggy rides with horses in Nassau sun hats, the straw market and all the trappings. Spend wisely, buy what you like and have a nice time enjoying the tropical scents and air and all will go well. 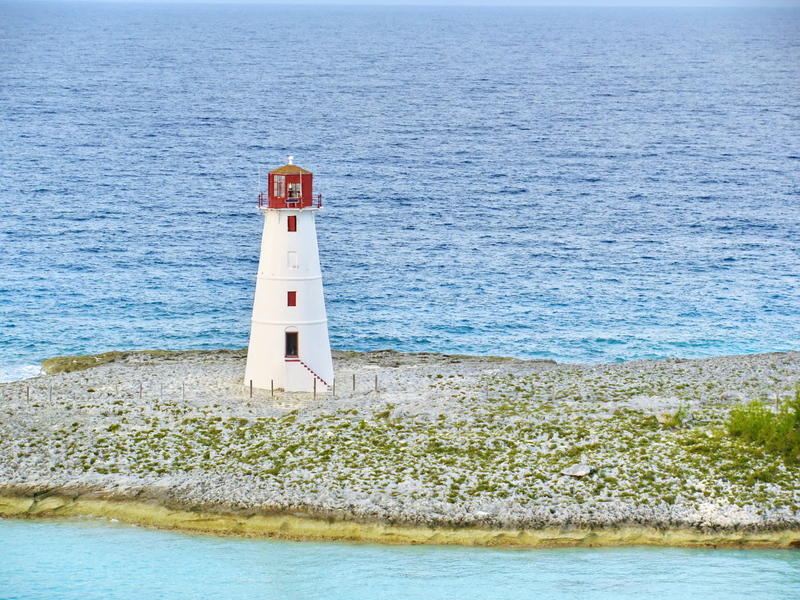 We headed back to the boat early to soak up the sun by the pool and awaited the departure around 5 pm when we waved good bye to the Hog Island Light house at the outer corner of the Pleasant Island (formerly Hog Is. 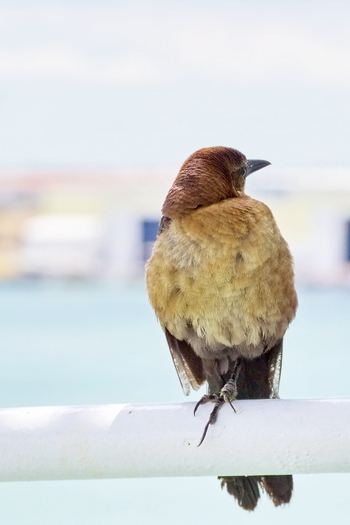 ), Port of Nassau. Back to dinner on board and Miami tomorrow. December 2008 - Cruise Details coming soon. View the photo album. Details to come soon. January 2007 - Cruise Details coming soon. Further photos and write up to follow. I can't believe I never did a write up on this cruise in 2007, my first on Norwegian. January 11th to 18th, Robin and I were cruising the Caribbean West. We made it to Grand Cayman, Cozumel, Costa Maya and Belize. Belize was a fascinating city, quite the under current of crime. We had a great time, below you'll hear of some of the antics we got up to on board and on shore! There's tons of pics in archive photo gallery too. Note (28/11/2012): This was mine and Robin's first cruise and what I thought about it. I've done 7 or so since now and I still feel that my thoughts from this cruise are relevant and many first time cruisers I have traveled with since 2004 have similar feelings as I wrote up in features in the Good the Bad and the Ugly. 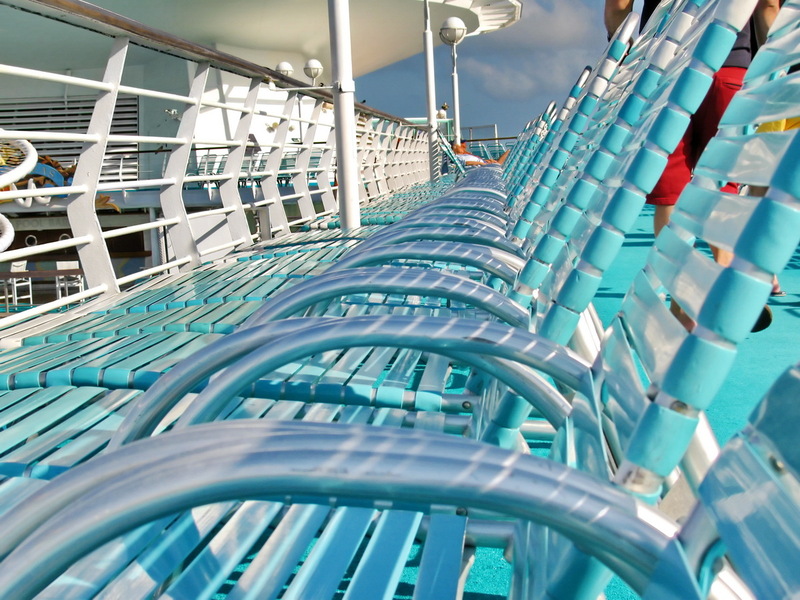 Some of the issues cruise lines have dealt with, others are still there. 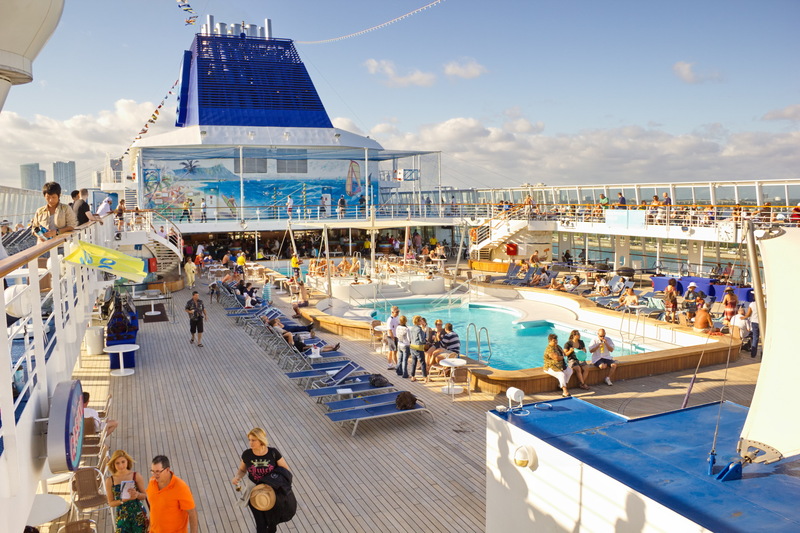 No matter, enjoy your cruising, there's good and bad in every cruise and some are better then others. 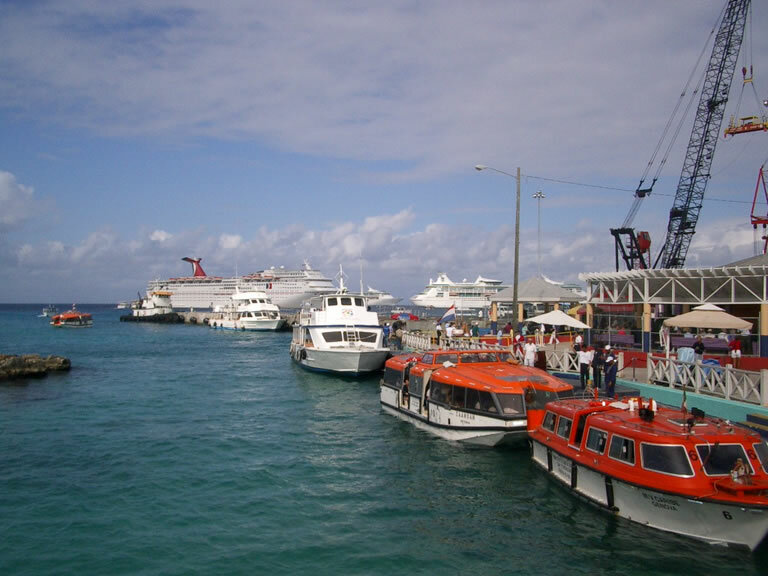 January 13th, 2004 we anchored the Inspiration off the port of Fort William , Grand Cayman. This was our first taste of the truly beautiful greens and deep blues of the waters of the Caribbean Sea. 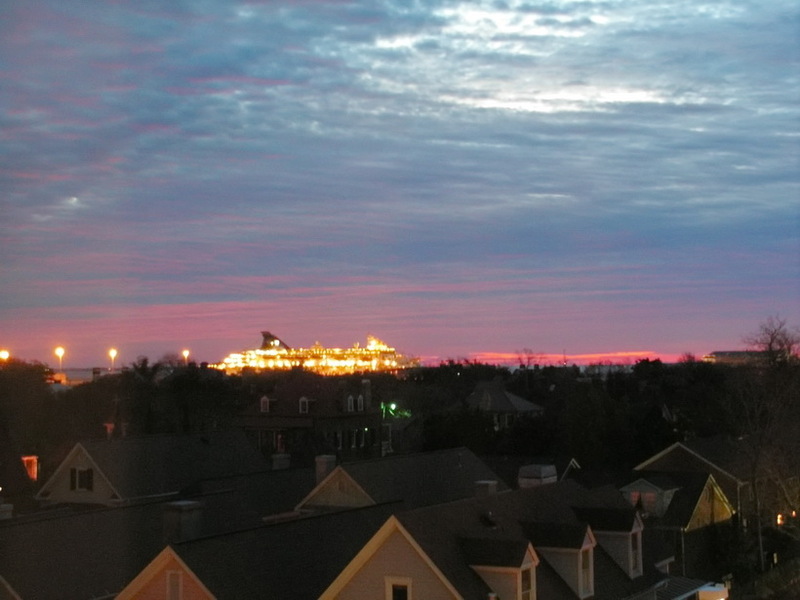 We anchored just before dawn and headed to town just as the sun had risen. Heading in on our little shuttles Robin couldn't miss the sign for the Grand Cayman Harley Dealership. Grand Cayman was quite commercial, but we did get our first taste of salt water here, when we took a dip in the beautiful beaches. We walked along the shore back to port, and picked up some pieces of coral for souvenirs. All went well until Robin noticed his cell phone missing. This caused a minor emergency. The customs officer at port was very good at helping to locate the taxi(bus) we'd taken earlier and checking it. This was to no avail though, since the phone was safe with the purser's office on board ship, where it had been turned in by the breakfast staff that morning. 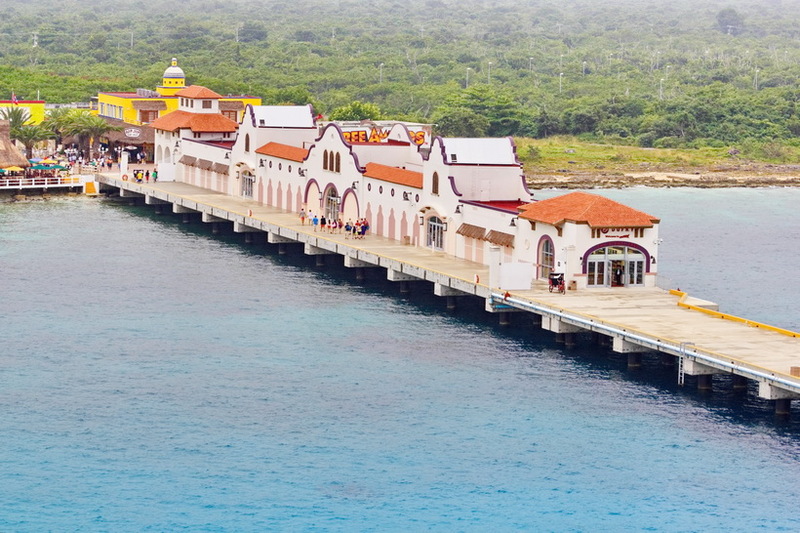 Costa Maya, Mexico is a beautiful new port along the routes of Cruise Liners. 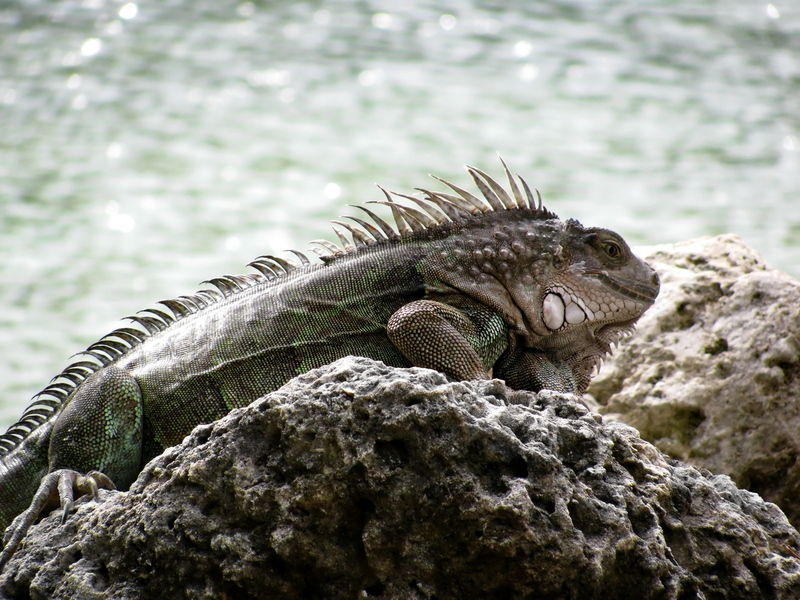 It sit amidst the Mexican Jungle with beautiful sandy beaches and quiet untouched rocky shores. Robin and my mother enjoyed a little too much Mexican Iced Tea (see above), and after lunch my dad and I had to drop them off at their cabins for a nap while we went out and explored more. By far, this was my favorite port and you can see more pictures in the photo gallery. In Cozumel we rented a little bug to see the Island. I guess the only place true Bugs are still sold is apparently Mexico. Our bug was basic with a front roof only, no carpeting and roll down windows with no air, but did the job just fine. We went downtown Cozumel to do a little shopping in there well built out door plaza and then after lunch we headed out to look over the Mayan Ruins. 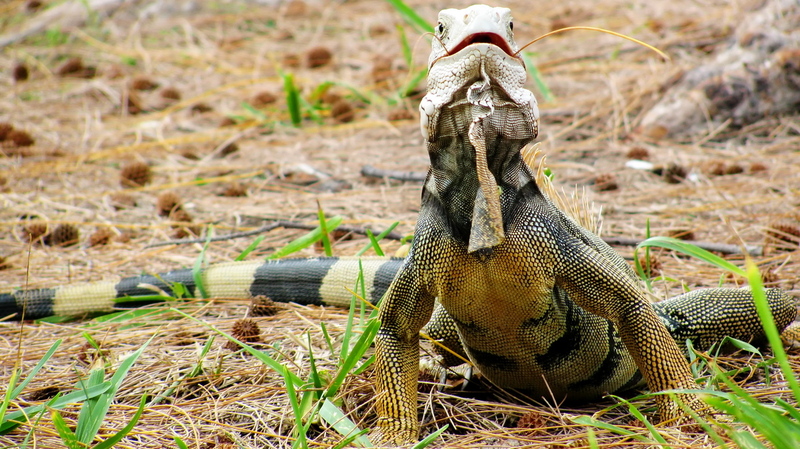 Belize, Central America , is a most interesting city. The undercurrents of crime here can be felt like a tension that can be cut with a pair of scissors. My mother actually panicked on the dock and decided not to even go into Belize. I loved the feeling of the tension and the crowds on the dock here and headed into town on foot with Robin. 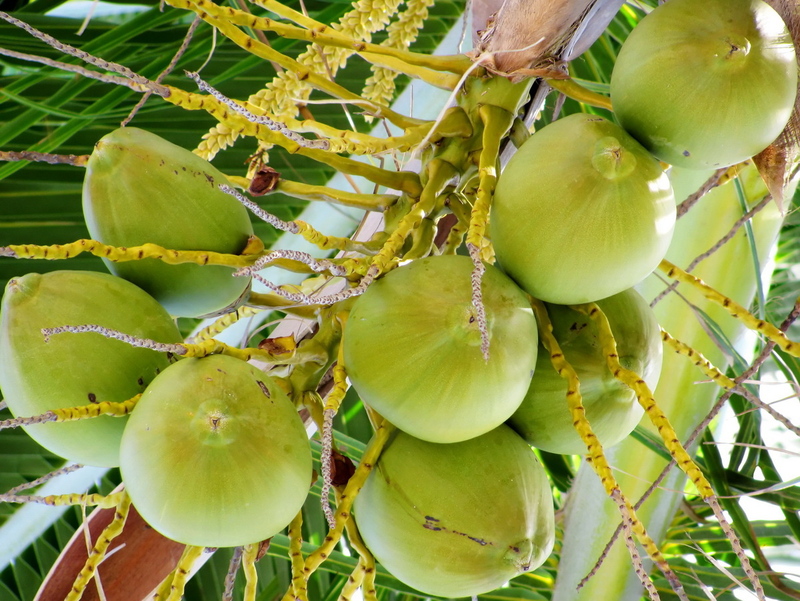 A local man (Mike) approached us shortly after leaving dock side and proceeded to guide us to the the museum, true Belize shopping (not the tourist spots), and the docks where the warehouses for the sugar cane they ship as one of their main crops. Mike did a great job of keeping the locals away from us and we tipped him well for his services. The museum is a must see. 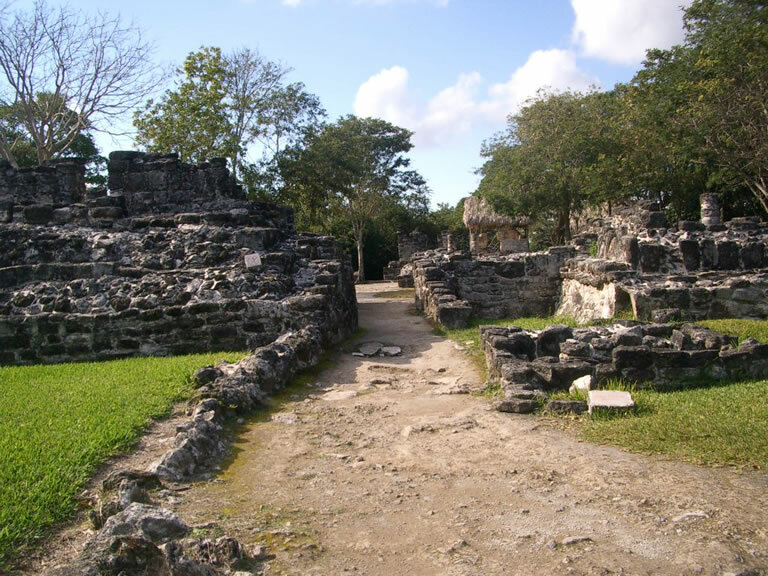 An old jail now houses many Mayan artifacts from the near by Mayan temples and ruins. The jail, only ceased use in the early 1990's and gives a true feel of the oppression these criminals lived in. 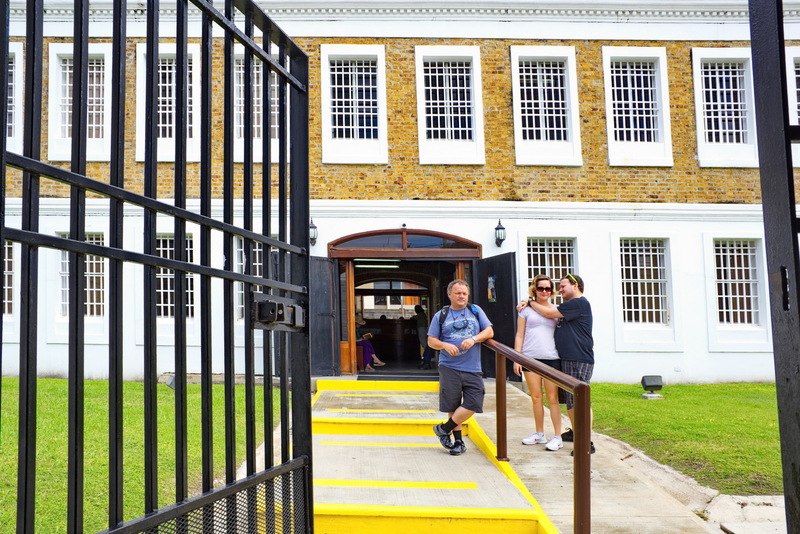 There's plaques and a history of the criminals who stayed in the jail, along with a very interesting collection of artifacts and a bug room with the local insects. Updated - October 2016- I've done a few cruises since 2012, last update. Coming soon I'll update on those. One on the Carnival Sunshine with our two grand daughters was the most fun ever. 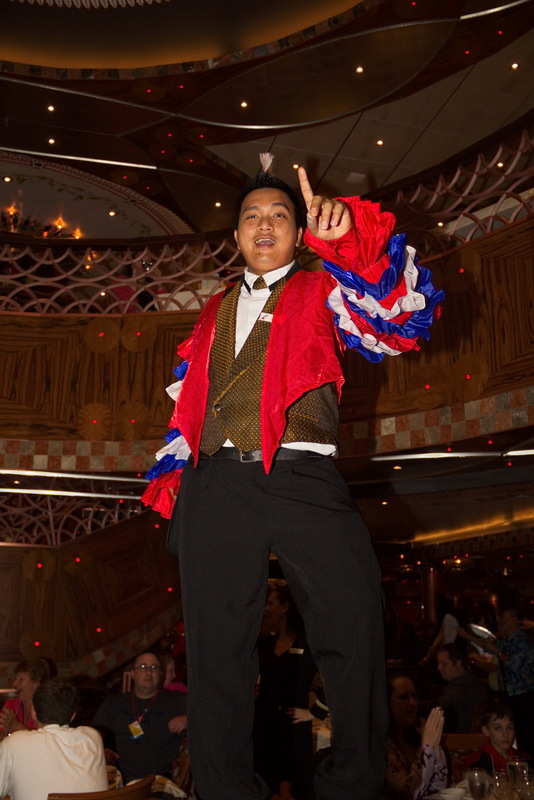 Carnival Cruise Western Caribbean, Carnival Legen, 2012 - Full detailed write up of this cruise on the Legend out of Tampa, FL. Cruising Caribbean East with Mom and Dad, Carnival Sensation, 2011- Port Canaveral to Bahamas, a nice diversion. 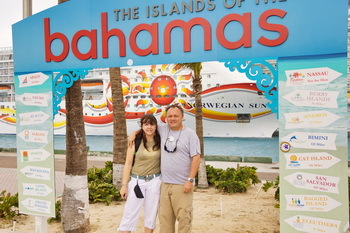 Miami and Bahamas, Norwegian Sky, December 2011 - A fun 4 day cruise and a night in Miami, what fun. 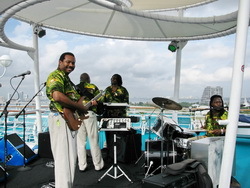 It's Better in the Bahamas, Royal Caribbean, 2009- 4 day, 3 night mini cruise to the Bahamas; get all the details. Cruising the Caribbean, Carnival Inspiration, 2004- Nice cruise pictures and details. Istock Portfolio - 132 and growing, sign up to purchase at www.istockphoto.com. BigStock Portfolio - Buy image singles at BIG STOCK.